"I started to fly the Convair while employed by Linjeflyg in 1969; we had some CV340 converted to CV440 standard and also some ex SAS CV440. 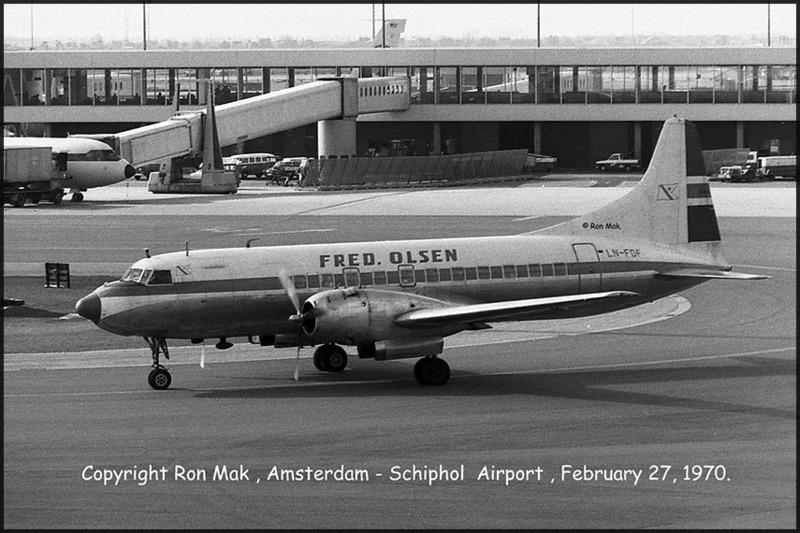 I flew it until 1976 when I was transferred to the Fokker F.28 fleet, later Boeing 737 fleet. As you may know we had the -500 version but also a leased -300s. We also flew the 'Falcon' B737-300QC fleet on daytime in passenger configuration, the Falcon pilots flew the aircraft nighttime in cargo configuration. In 1993 we were integrated into SAS and as we, the 737 pilots, had experience of the type we were the first to fly the new B737-600/700/800 delivered to SAS! SAS had been a Douglas customer with several versions of the DC-9/MD80, but I had amassed some 3.000 hours Convair experience and that is perhaps why I have a special interest in the type!" 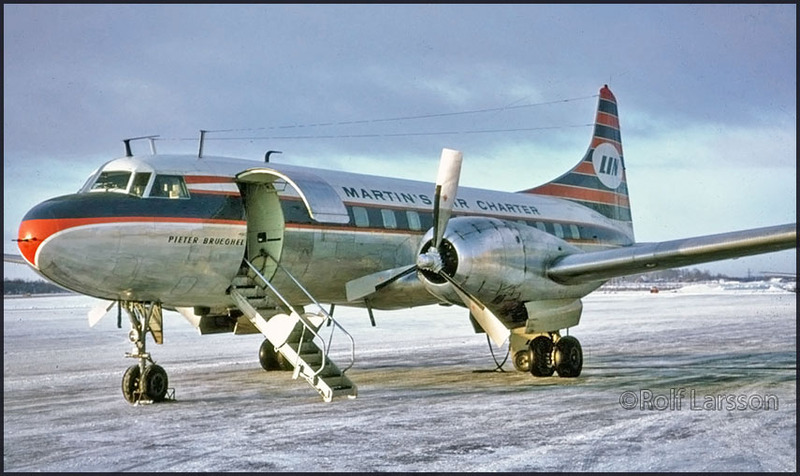 Martin's Air Charter (MAC) Convair CV440 PH-CGD, leased to Linjeflyg. The name 'Pieter Brueghel' stems from KLM use, as one can see from a photo further down this page. "I am sending a picture which may be of interest to you personally, our company Linjeflyg had a good relationship with Martinair. In 1965 Linjeflyg leased CV340/440 PH-CGD, which was delivered on 31Dec1964 and leased until April 1965. 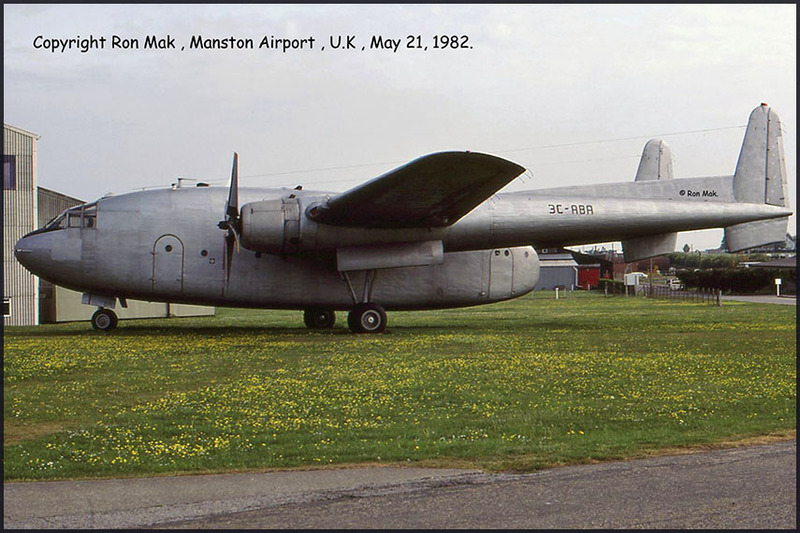 It was a replacement for SE-CCK, which was tragically lost on 20Nov1964 (ASN report). We flew it in basic Martin's Air Charter (MAC) colours, but with LIN on the tail! When it went back to Martin's MAC it was converted to CV640. I never flew this aircraft, as I started to fly the Convair in 1969. I took this picture of PH-CGD at a wintery Bromma airport early 1965." ATDB.aero on c/n 104: 'KLM PH-TGD, rr PH-CGD - Martinair PH-CGD - Tussey & Associates N111TA - McCollum Aviation N111TA - Falcon Airways N111TA - Wright Airlines N861FW - Canada West Air C-GCWY - Norcanair (leased C-GCWY) - Century Airlines CV640(F) N640CM (unused) - C&M Airways N640CM - Aeronaves TSM XA-URL (currently operating, march 2017!). 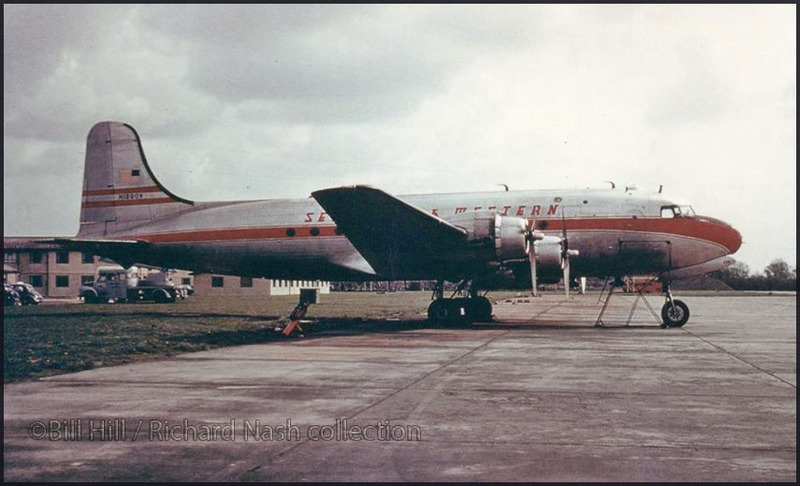 And then George Macadie contributed this excellent photograph of that very same ConvairLiner, c/n 104! 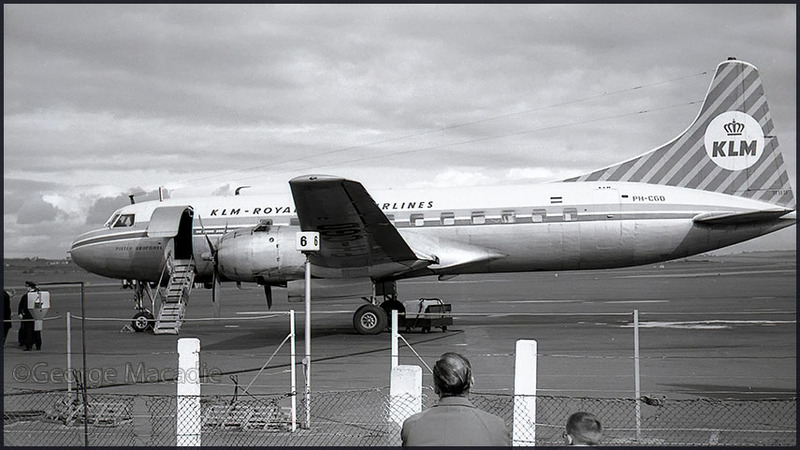 Convair CV340 PH-CGD (c/n 99) with KLM - Royal Dutch Airlines. So the name 'Pieter Brueghel' stems from KLM use. Beautiful times when one could get so close to travelling family or friends and to get a picture in! Rolf Larsson sent me a 'mystery candidate' here, in the category what happened to it..? Whilst on the subject of Convair he threw in a few for good measure..
Rolf wrote:"I have a problem with the fate of another Convair, CV340 c/n 99 SE-GTE which became N14CD. at Stockholm-Arlanda on 26 September 1977." 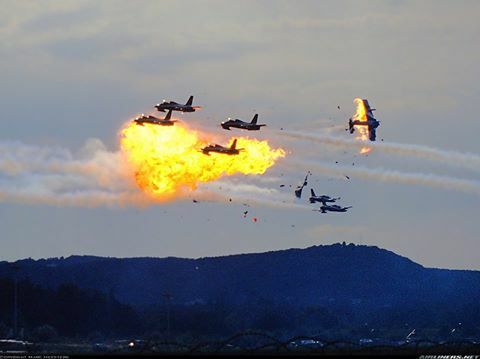 Rolf added: "Regarding SE-GTE/N14CD, I have never learned what really happened to the aircraft. I have seen reports of it as being stored (in Texas? ), but nothing more. However I have never seen any pictures of it in the USA, except for the pictures taken in the Miami area after arrival from Sweden. Presumably scrapped... but not in the Miami area!" This thread started by Rolf Larsson prompted Ron Mak (his Vintage Propliners here on ONE - TWO - THREE) to contribute several fine photos in support of msn 99's history and fate. 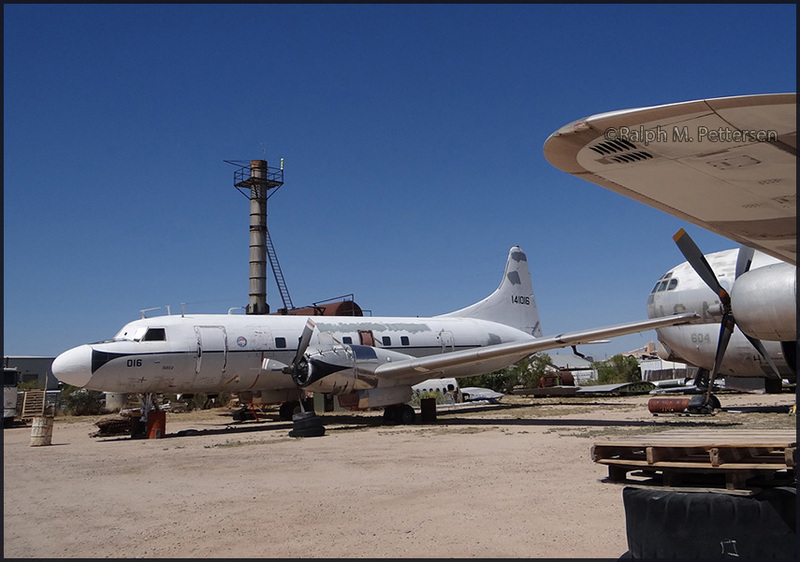 These dates 1980 and 1981 may well have been the last sightings; scrapped at some point after that, alas..
Facebook page for Beech 18/ C45/ AT11/ SNB Group had a posting (16/3/17) by David White: "Ran across this in Moriarty,NM a couple of days ago. It is behind the CAF Restoration hanger. No one around so I was unable to learn anything about it." 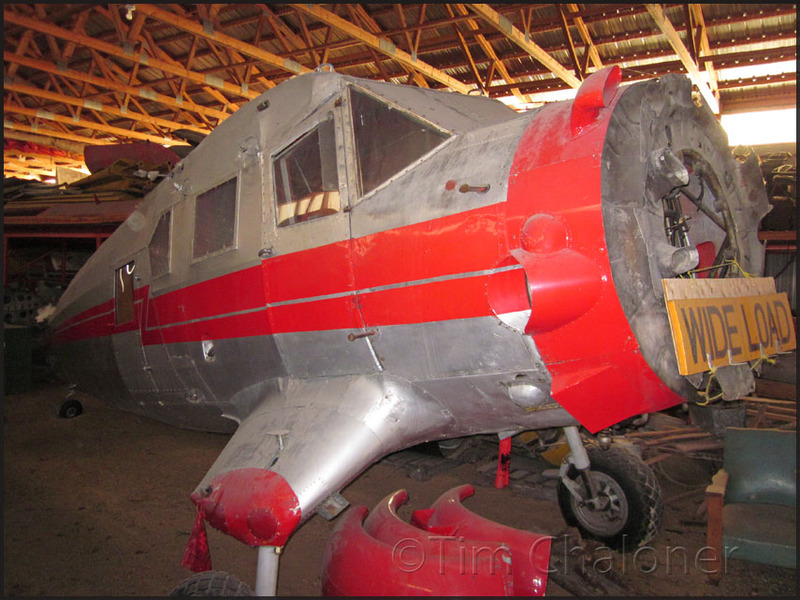 Believed to be one of the donor birds for restoration of Beech AT-11 (c/n 877), but which one, where did it come from? The wing is cut off at the fuselage on this AT-11, maybe to facilitate transport or has been lying around somewhere like this..? 'This is a WWII veteran, AT-11 41-9451 (c/n 877). 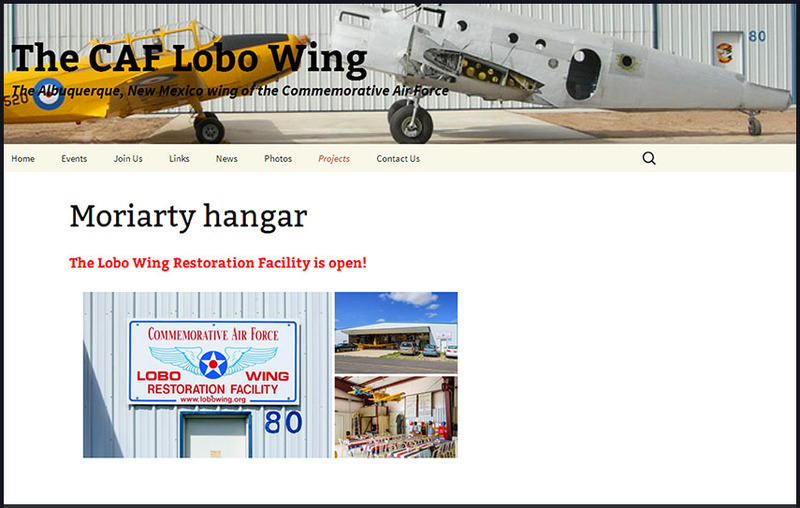 It is being restored by the CAF Lobo Wing at Moriarty. Delivered 21Jan42 to the Bombardier Training School, Albuquerque, NM. It was sold as surplus in Jan46 for $3,178 as NC52845. Fifteen civil owners later it has been under restoration here since 2004.
some history is added (further below) and a nice color scan of it from a Larry Smalley slide. Larry and Billl Larkins often traded images (Bill shot B&W) and Larry color slides." 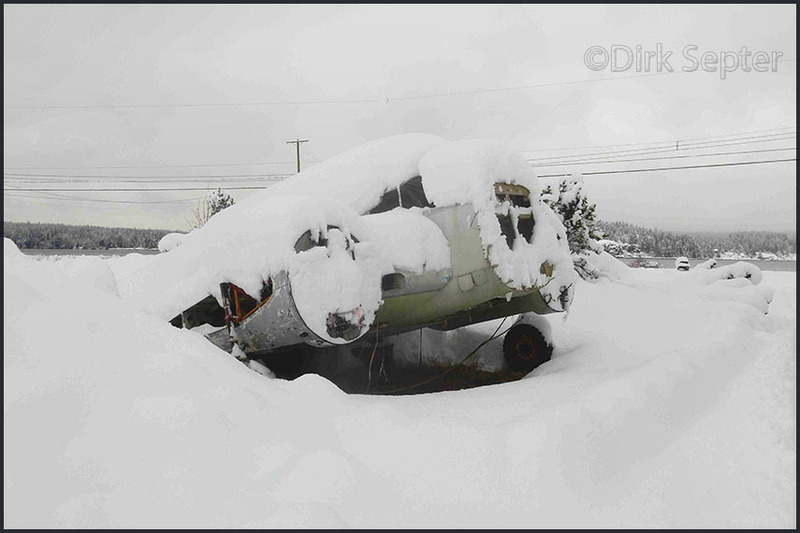 David Lehman wrote: "Does anyone know where the final resting place of N8042H, c/n 6572 is/was? There's a picture of it on twinbeech.com. The picture was taken by Bill Larkins in front of my Dad's shop in Concord,CA. If it's the one I think it is, Dad converted it and sold it to Vern Johnson. I think it's the only one Dad converted as the market for 18s turned out to be soft and I remember the remaining C-45s going for scrap! N8042H was last registered to Donn Harling in Sherman Oaks, CA and the NTSB accident page shows it damaged at Van Nuys in 1967. I'd like to think it is a survivor, but it's not very likely..?" 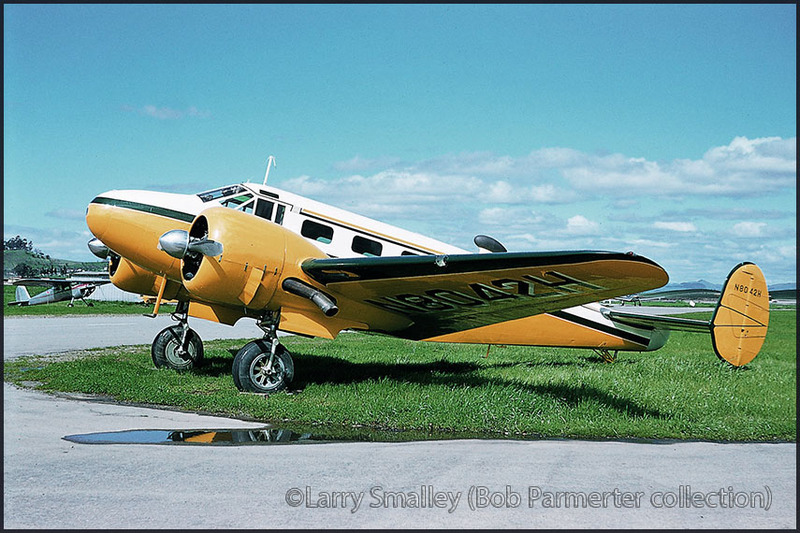 "There was a mix-up with the c/n on CAA/FAA paperwork, the correct number (ties in with the military serial on the paperwork and in Beech files) is c/n 8523. C/n 6572 was actually 43-35834, a C-45F that suffered an accident on 11Mar49 at Bolling Field and reclamation (disposal) was completed on 06Jun49. There is no record of it ever becoming civil registered." C-45F 44-87264 USAAF Delivered to 610 Base Unit, Eglin Fld 19Jun45. Then to Air Proving Ground, Eglin. Reclamation approved at Hill AFB Oct54. 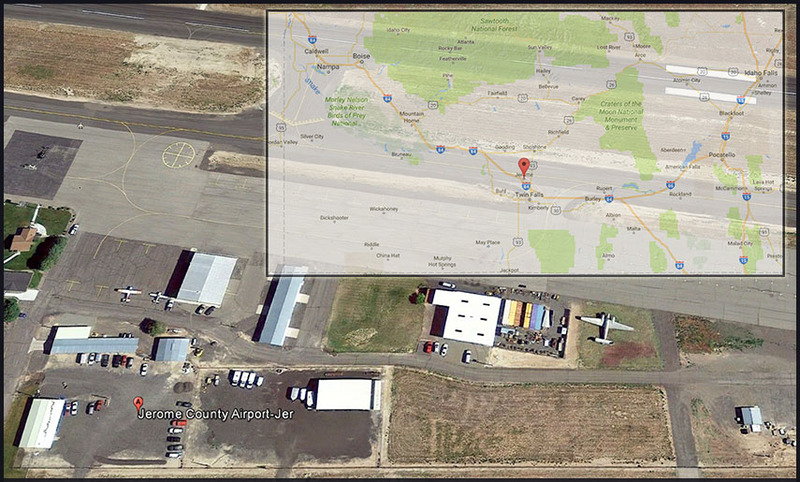 USAF Hill AFB sold to Gene Hughes Drug Co, Sacramento, CA BS 12Oct56 for $5,919.19 as C18S N8042H [with correct USAF serial but erroneous c/n 6572]. E.P. Hughes, Sacramento, CA BS 12Oct56. Vern R. Johnson Inc, Danville, CA BS 18Oct56. CofA 23Jan57 (2,953 hrs TT). Photographed by Bill Larkins at Buchanan Field, Concord, CA in Jun57 along with a batch of other surplus 18s. Baker Aircraft Sales Inc, Long Beach, CA BS 4Apr58. John W. & Mary W. Dorr, Orinda, CA BS 10Jun58. Publishers Art Inc (Pres Edwin A. Schnepf), North Hollywood, CA BS 10Jul65. Donn Harling & John Grimes, Sherman Oaks, CA BS 30Sep66. Damaged when the main gear retracted on landing at Van Nuys, CA on 16Jan67. No injuries. Repossessed by Publishers Art Inc in Feb67. Registration revoked 19Jun71. --Bob Parmerter (Historian), Beechcraft Heritage Museum - www.beechcraftheritagemuseum.org), Tullahoma,TN. Keeping on the subject of 'aircraft resurrections' this fine contribution by Ralph Pettersen fits very well here! 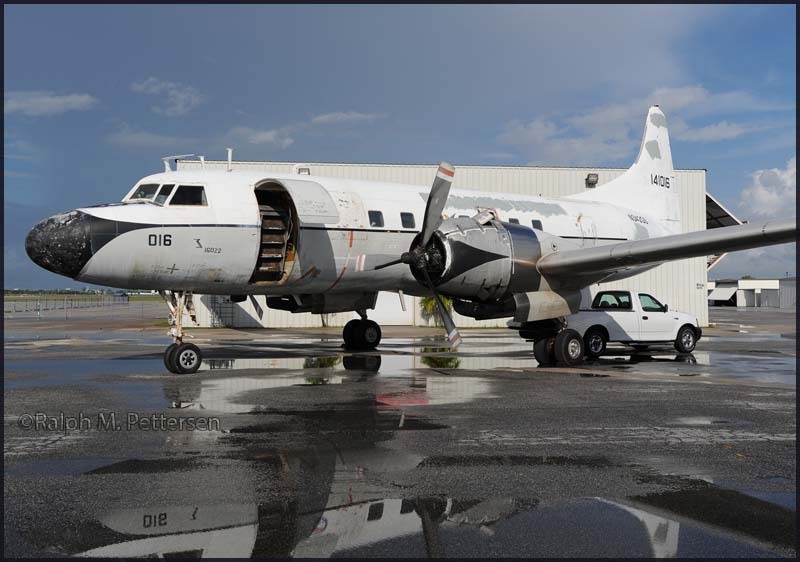 'Well-known Propliner guru Carlos Gomez traveled to Tucson, Arizona, in mid-August 2016 to rescue two former US Navy Convairs C-131Fs that had been stored in the desert since the early-1980s. Four C-131F aircraft had been	acquired in 2013 by Carlos and partners Marc Wolff and Tom Cooper including N341GS (BuNo 140998), N342GS (BuNo 141016), N343GS (BuNo 141022), and N344GS (BuNo 141028). They had been parked at the Air Restoration and Marketing (ARM) boneyard for many years but were essentially intact and in good condition as the result of the dry desert environment and their post-retirement cocooning at Davis Monthan AFB. Work began on 25 July when all four aircraft were inspected and it was decided that N342GS and N343GS were the best candidates	for restoration. Both had their original 1960s passenger interior complete with plaid seats. Both aircraft were flown over to Opa Locka,FL in August 2016. C-131F N343GS is fitted with spray booms and is certified for both cargo (Part 135) and spraying (Part 137 operations)." Carlos designed the sprayer system on N343GS so it can be installed/removed in just a few hours. When the aircraft isn’t under contract for standby dispersant work, the spray system is removed and it is used as a freighter. Ralph's post has been editted slightly to abbreviate a little and represent here only the main details. 'In August 2016 Carlos Gomez and a small crew 'awakened' two former U.S. Navy C-131F’s that had been stored in Tucson since retirement by the Navy in the mid-1980’s. In less than three weeks, both aircraft were airworthy and the FAA had issued permits allowing ferry flights back to Opa-locka Airport in Miami. N343GS (ex/ BuNo. 141022) is now in daily service flying cargo to the Bahamas and other Caribbean destinations. The second aircraft (N342GS/BuNo 141016) has a bit of a special history in that it once flew former U.S. president Harry S. Truman in 1961 on a roundtrip flight from Kansas City to Las Vegas, where he gave a speech. 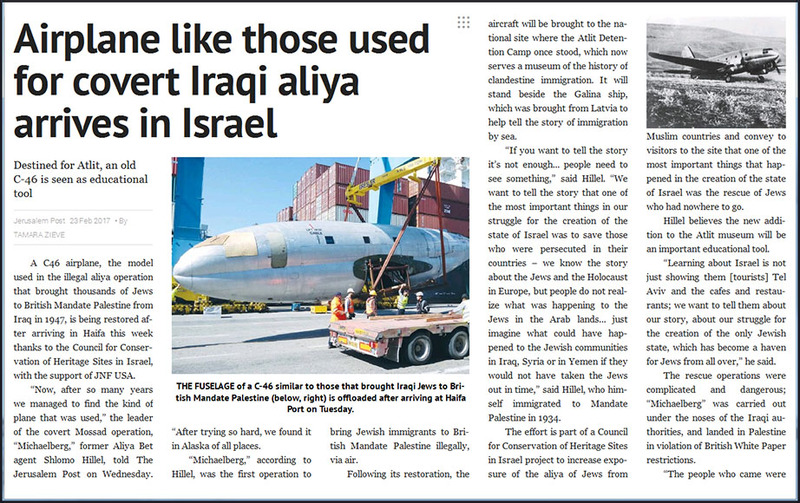 Rather than converting this aircraft to a pure freighter, Mr Gomez wants to preserve this bit of history by carefully restoring the aircraft to allow quick changes from cargo to passenger configuration. The aircraft is currently configured with a VIP area in the front of the aircraft, with regular 4-across seating in the rear as shown in the photos. This configuration will be retained but the entire interior will have to be refurbished since 30 years of storage in the desert has taken its toll. In addition to the interior, the aircraft will need to have modern avionics installed and will be painted in U.S. Navy colors, similar to those worn while in service with the Navy. Work has already begun on the project with exterior sheet metal work well underway and removal of the interior having started last week. 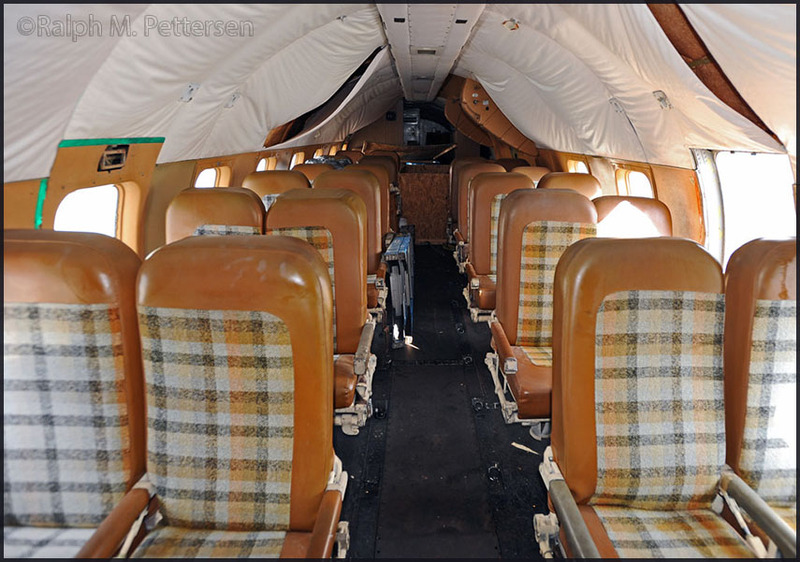 Interior of C-131F N342GS; who wouldn't want to travel in style like this..? 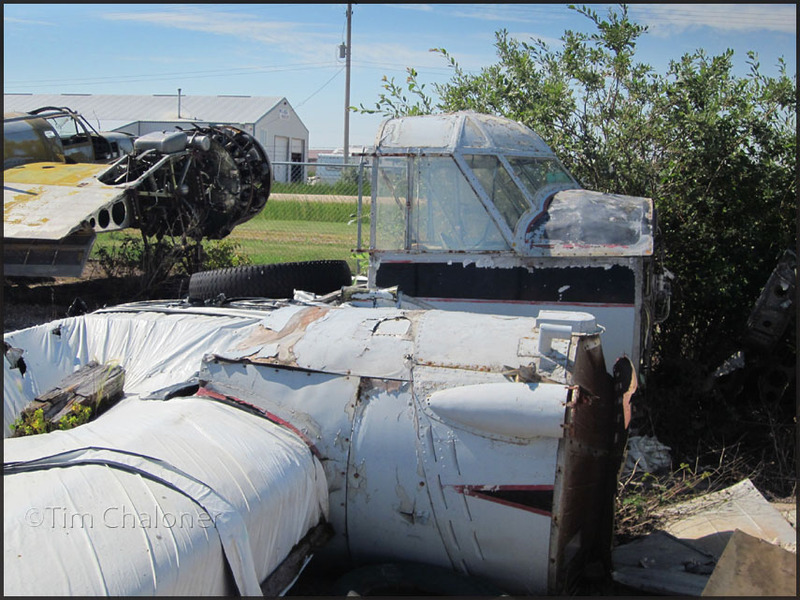 The restoration is expected to be complete by mid-July and plans on showcasing the airplane at AirVenture 2017 in Oshkosh. 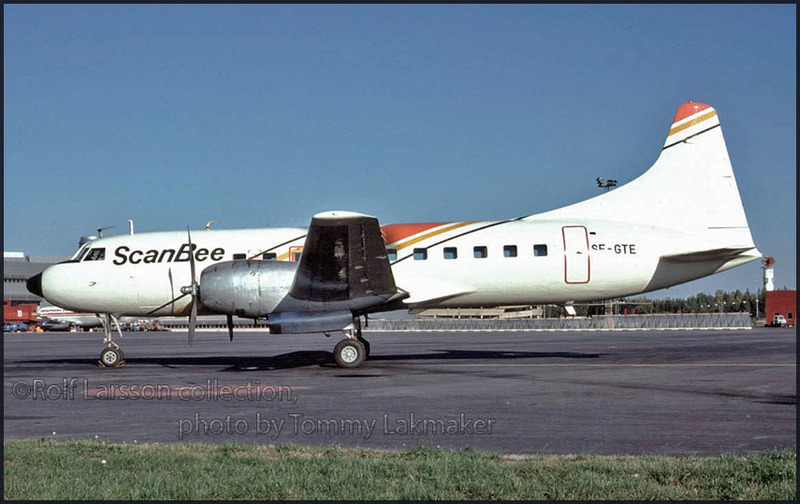 The current plan is to have the Convair fly freight most of the time and make the quick change to passenger configuration for passenger charters and enthusiast flights as demand warrants. Since there are very few Propliners available for enthusiast flights, Carlos believes that a sufficient market exists to justify the conversion. The key to the success of his plan is that the majority of the fixed costs of operating the airplane will be covered by freight operations with passenger flights only having to contribute a proportional fair share of costs. By doing this, Carlos believes the cost to passengers on enthusiast flights can be kept reasonable. Interior of C-131F N342GS. Will 'propliner' enthusiasts put their bums here in years to come? Help $$$ needed!!! 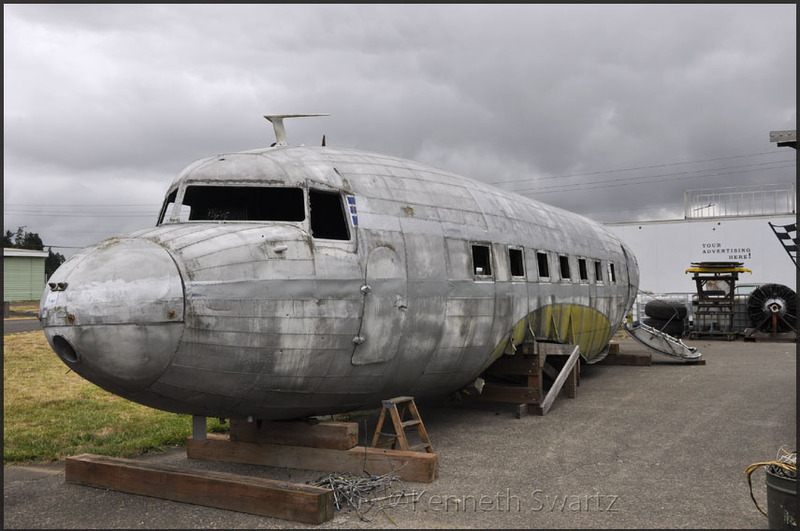 The cost of restoring an airplane of this size to a pure freighter is upwards of $400K, but the additional cost of making it into a quick change aircraft is significant and Carlos Gomez is reaching out to the enthusiast community for donations to make the restoration a reality. 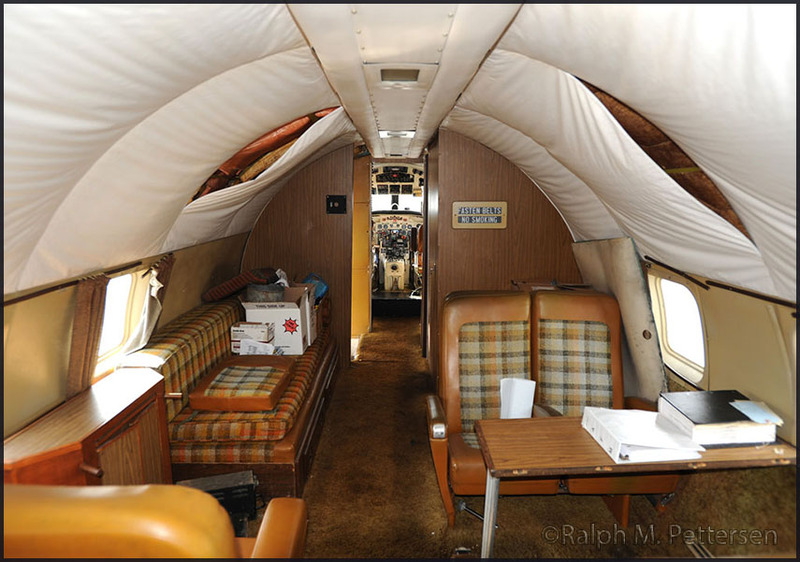 This is not pie-in the sky stuff as work has already started on the restoration and one only has to look at what Mr Gomez has done with the three Conquest Convairs currently being operated, to know that your contribution will be well spent. (A PayPal option is hopefully available soon). Website of the Historical Flight Foundation, www.n836d.com (started for restoration and operation of DC-7B N836D 'Eastern Airlines') is no longer current as the project failed/is on hold indefinitely; hopefully a new website to enable news on this project will be made available. Having adressed the subject of plane restorations in advanced stages, this is another one I am looking forward to though it hasn't a clear schedule for the intended flight to the Netherlands. A deadline may be the 100th aaniversary of KLM in 2019. An excellent photo by Erwin Stam ('ErwinS') seems a fitting opportunity to put the spotlight on this worthy cause! This fine image was shared on www.facebook.com/FlyingDutchmanFoundation/ on 14Mar2017. At the moment this 'FDF' has volunteers rotation through Jo'burg-Rand, as can belearned from the post on 15Mar17: "The team currently at SkyClass Aviation, working on our DC-4: Francois, Martin and Patrick from Skyclass, Theo and our volunteers Erwin and Derk. Every 4 weeks we want to have a few volunteers in South Africa to gain experience with the DC-4 and learn from Francois and Theo." Not sure when the lease and flying by Skyclass end, after which it was stored at Rand. Torrejon AB, Madrid in Spain." I think that is an airconditioning unit cooling the interior (cockpit?) of 0-48073..? Gordon replied: "Heating duct. We are not trying to cool the plane down we are trying to heat it up! This is december." Later on Gordon sent another photo of (probably) '073, which I added on Photos by Friends & Guests (49). Douglas C-47A-30-DK 43-48073 of which Joe Baugher (1943 serials) reports: "Batch 43-47963/48262. Msn25334. on civil registry as N93043." "Constructed as a C-47A-30-DK c/n 13889, by Douglas at Oklahoma City, Oklahoma, USA. Ca.1943: taken on Strength/Charge with the United States Army Air Force with s/n 43-48073. New construction number (due duplication at manufacturer's plant) 25334 assigned to the airframe. (No date) Markings Applied: 0-48073. Placed on display. ..July1968: to 7th Special Operations Squadron, Ramstein Air Base in Germany. ..May1973: returned to the US. ..Jun1973: transferred to Warner-Robins Air Materiel Area. Sent to Warner-Robins for issue, as N94043. 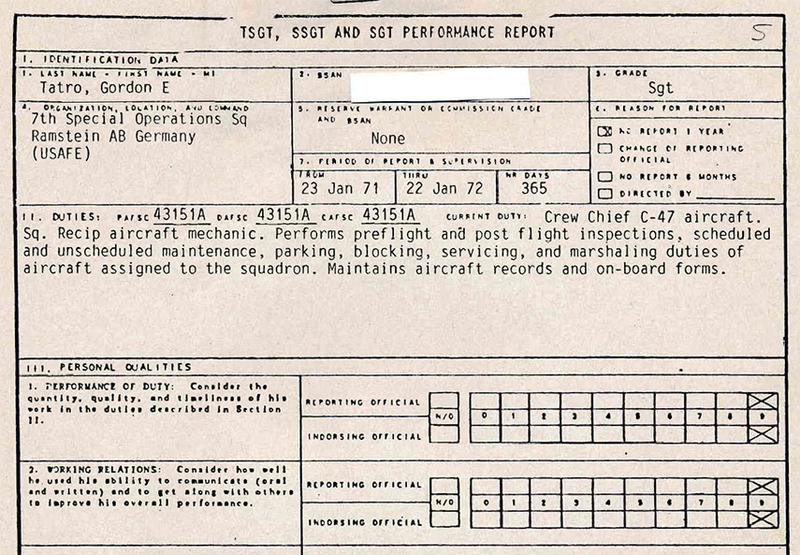 18 January 1974: struck off Strength/Charge from the United States Air Force. (Same date? ): to US Department of Agriculture reg'd N94043 [sic]. 14Feb1981: to unknown owner with c/r N93043. Sale reported to a new owner in Tulsa,OK." "I am so excited to find out about my plane! I was Crew Chief on that plane (also on another: 48219) while I was stationed at Ramstein AB in Germany while serving with the 7th SOS (1970 to 1973ish). We had three Gooney Birds acft: #073, 074 and 219. It was during that time that the 7th did training in Greece for the Son Tay prison rescue raid, West of Hanoi, using 'Combat Talon' MC-130 aircraft. Some of the missions we flew with the C-47 were in support of their training in Greece (but I'm not positive about that--naturally they did not tell me such secret stuff!). Then they flew their 130s all the way to Florida and then onto SEAsia for the raid (I believe it was staged out of Korat RTAFB, Thailand). I understand the crew that went on the mission was asked to volunteer, but were told they would not be told what they were volunteering for... And they did not find out until they were on their way to S.E. Asia! There is a book about this mission and the 7th SOS. The book is called: 'The Praetorian Starship: the untold story of the Combat Talon', by Jerry Thigpen. Gordon wrote as a follow up to the above: "I have some more pictures and will get them to you but it will take some time. I have here a nice one of C-47 48073, taking off from Bad Tolz in Germany. 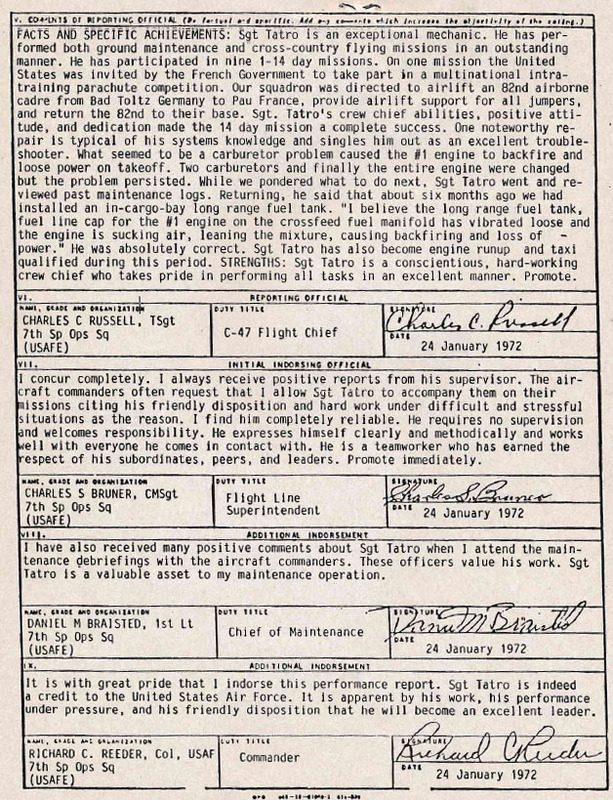 I whave also scanned a copy of my Airman Proficiency Report during that time." Gordon wrote: "The picture of 0-48073 on take-off had troops in it and they jumped (parachutists). The stay out there at Bad Tolz was about 4 days, so there were many touch-and-goes and troops to jump. I took care of the plane doing jobs such as: Pre-flight & Basic post-flight (BPO) inspections; to include fuel & oil and did the hydraulic servicing, etc. I did not always fly with them but my work day was (basically) before it flew and after it came back. The cargo door is off here, because there were to be jumpers or some bags of supplies were to be dropped to 'supply' troops already on the ground; these were all training situations. The APR (Airman Proficiency Reports) forms are one set (front and back) of the few that I have remaining. This one is specifically interesting as if you look to the last signature 'Reeder'. This Colonel was a specifically important individual and his picture is often found along with others when surfing the internet regarding the 7th SOS and the Son Tay prison rescue raid (west of Hanoi). or 219, I just have to dig up my old military records, they should be in a box somewhere in my storage locker...I hope!" Much of my stuff is lost... With all the moves I made and then a had handicapped daughter (born in 1988 in Germany), the stress of moves and all the hospitals and preme incubators, etc. etc. I got to the point where stuff just got missing. I went through a divorce (1996), left California (where we had settled), struggled across the States to regain my 'life', went to live with my parents in Massachusetts (a 3.000 mile trip with barely enough funds for gas, no food just candy bars and no motels). Dealing with such difficulties many things that one might believe are or could be important, just do not get the space to survive or even the time to consider. Like running from a burning building, one doesn't think too much about what value things might hold later in life. Frankly, for all the nine years I was in Germany (I went back in 1982 with my ex-wife to be) and we had tons of valuable items. Now as I look up from my keyboard, I see only three rather cheap beer steins and one beer stein from the 1985 Oktoberfest in Munich! In a sense I am trying to use the internet to patch-up some of the holes in my complicated life. But that's O.K., I certainly did not sit around: I skied many mountains and literally have put my foot in nearly every country in Europe; travelled from Andorra to San Marino, visited Greece, Italy, Portugal, Monaco, etc. etc. Not all on military missions of course. Now I read science stuff, check the internet, revisit some history on websites such as yours." 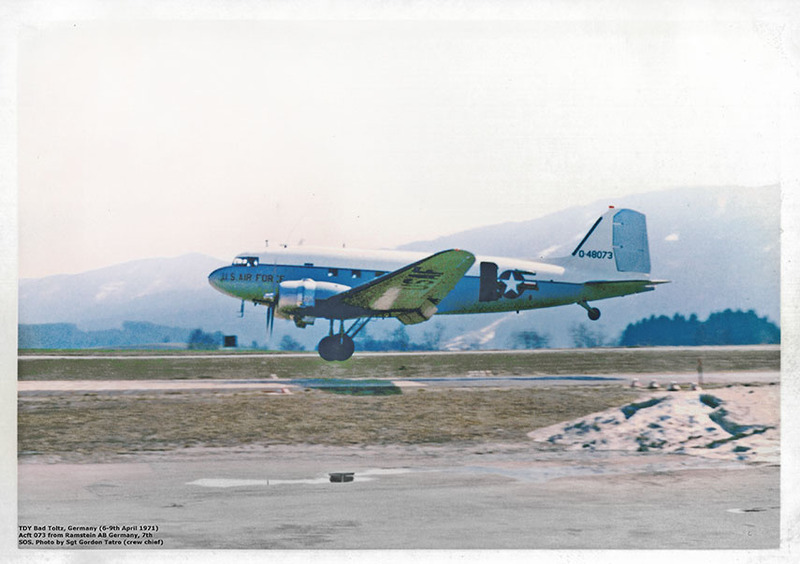 "I guess for all the time I spent at Ramstein AB the period 1970-1973 was the most exciting and different (Korat, Thailand with the EC121Rs was more about routine orbits mostly over Laos & Cambodia and some over Vietnam). When I went back to Ramstein, from 1982 to 1988, I was assigned to the 86th CES (Civilian Engineering Squadron); it got changed to the 377th CEG (Civil Engineering Group) and I thought I was through with airplanes. Seventy people eventually got killed, mostly from burns. I was at the Air Show as a spectator (yet in uniform) and the solo plane came to rest at the ice cream van (burning the Germans who were picking up the free ice cream as the Italians were the closing performance of the day): 150 feet from where I was standing! I think if I have any PTSD it is from that air crash, I saw people and children on fire. A good friend of mine lost his five year old daughter, his web is here www.ramstein-1988.de/." 70 fatalities: 3 pilots and 67 spectators perished. Many, many more suffered severe burns. Fred Goth had his 1967 photo shared on facebook by 'Verenigde Vleugels'; a scene of 50 years ago! 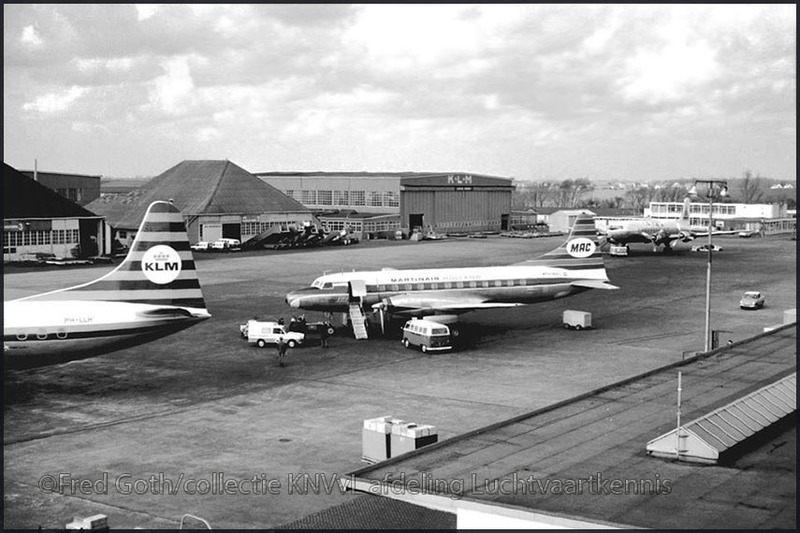 "Today (12Mar2017) exactly 50 years ago, this photo was taken at Amsterdam's Schiphol Int'l Airport. At center stage we see Martinair's Convair 640 PH-MAL, having been taken on strength only about six weeks prior to this date. The aircraft came from Swissair and had arrived in november 1966 as a Convair 440 at Woensdrecht for conversion to CV640 by Avio-Diepen, equipped with Rolls-Royce Dart turboprops. 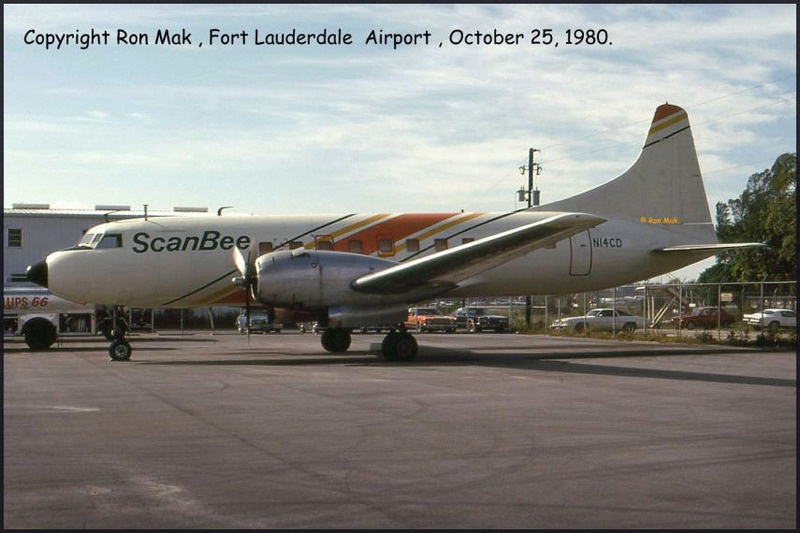 After the introduction of the Douglas DC-9 and Fokker F.28 in Martinair's fleet, the PH-MAL was sold in the United States. And it may still be around somewhere in Mexico, as XA-UNH." History of c/n 332: HB-IMC (Swissair) - PH-MAL (Martinair) - N640R (Zantop + Century A/L + C&M A/w) and, after a number of years having been stored at El Paso,TX (aprox. 2004 - 2009) to presently XA-UNH (Aeronaves TSM) and last reported 22Dec16 @Hamilton,ONT operational! 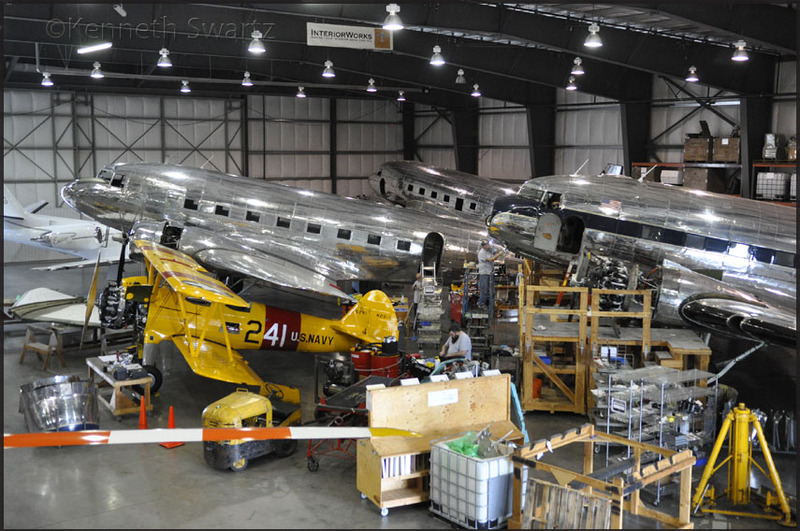 On the left in th ephoto is the tail of Lockheed L.188 Electra PH-LLH. I can't identify the aircraft in the distance, though I feel that triangle on the tail should mean something to me; TMA of Lebanon? PH-LLH (c/n 2015) went from KLM to Universal A/L (N858U), Saturn A/w (N858U), Transamerica A/L (N858U), NWT Air (C-GNWC), Falcon Air (SE-IVT), Jet2 (SE-IVT) and after use by ASL AL Ireland (EI-CHZ) it was scrapped at East Midlands (EMA). 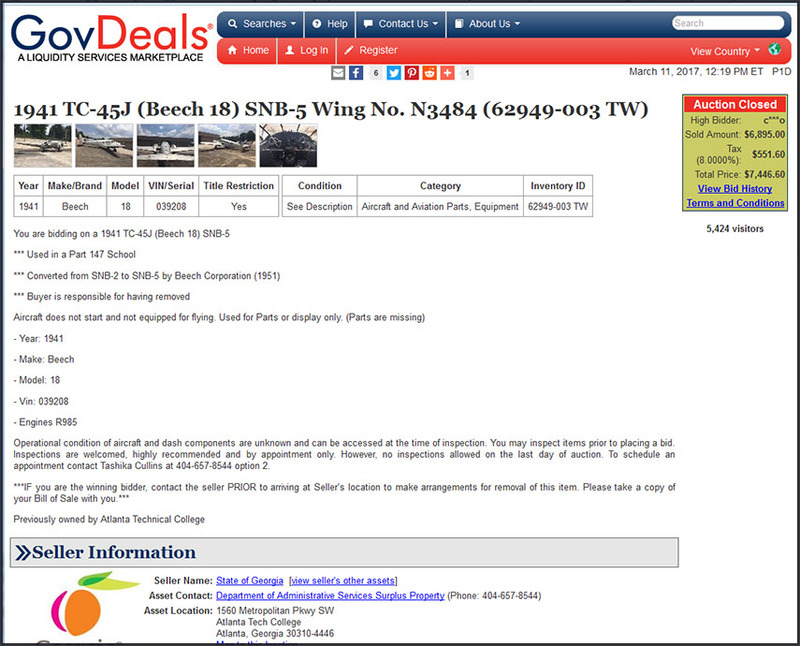 Beech SNB-5 / TC-45 N3484: sold but not saved? 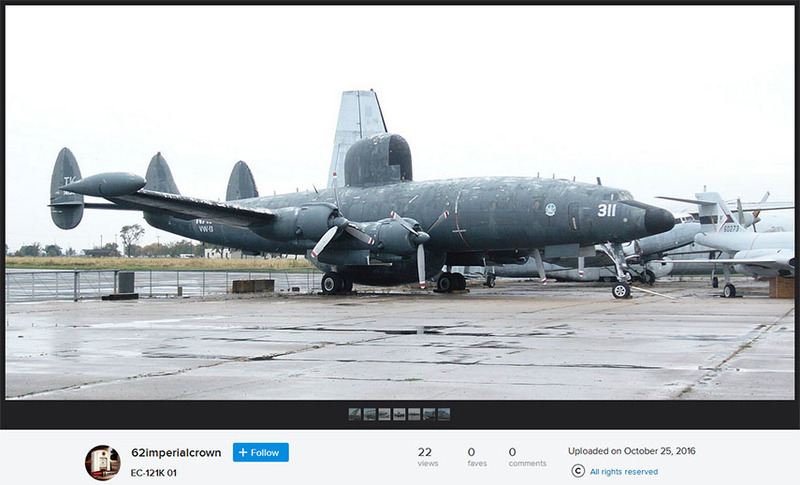 Its history, briefly, until this sale:'39208 (MSN 4292) remanufactured to SNB-5 c1954 (new MSN N-637). Redesignated TC-45J Sep 18, 1963 then UC-45J Oct 14, 1964. To MASDC storage. SOC Apr 30, 1968. This Beech was photographed and identified (w/ full history by Bob Parmerter) on Photos by Friends & Guests (9) and later shown again on Photos by Friends & Guests (13). It seems it was sold by auction and then very soon after offered for parts on Barnstormer.com? Or parts taken off & offered for sale while the remaining airframe is offered for free on condition it is moved elsewhere in its entirety? The wheels and brakes are thought to be about the only parts left of any value, though I could see ornamental value in it (plenty of examples on roundabouts, entertainment parks or with a transportation or science museum). Having read the finalizing stages of C-FNJE's restoration project I posted queries on Yahoo fora and WIX (Warbirds) for similar end-staged projects. 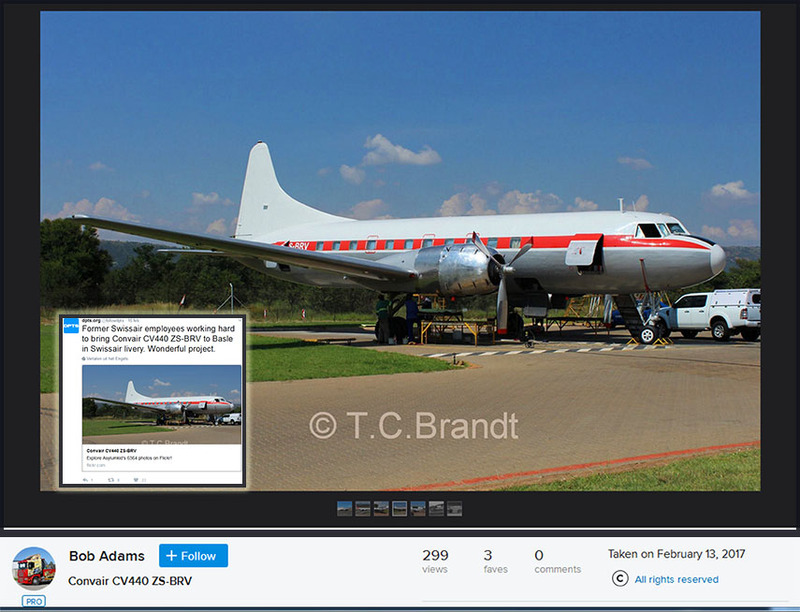 This led to below info on ex/ Rovos Air Convair CV340 ZS-BRV. A posting on Twitter by 'dpts.org' led to this photo by T.C.Brandt (Tim Brandt SA Spotting') of ZS-BRV at Wonderboom Airport (PRY / FAWB). BRV must have had this red cheatline recently applied. 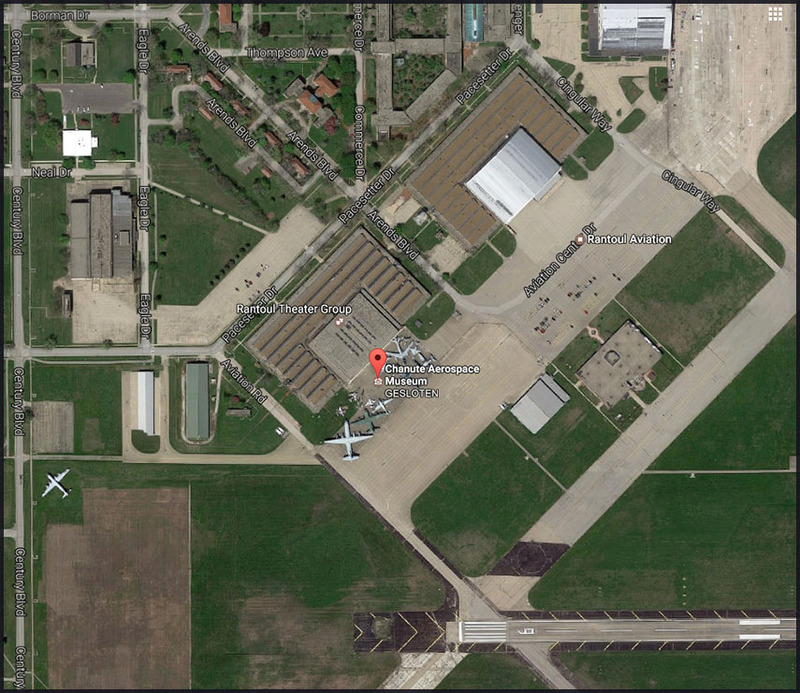 at Dole-Tavaux Airport (LFGJ / DLE) and should leave Wonderboom within a month from now locals say.."
Note from webmaster: Breitling's role is probably a sponsorship and I doubt if they are or will be the owner - EMAIL. 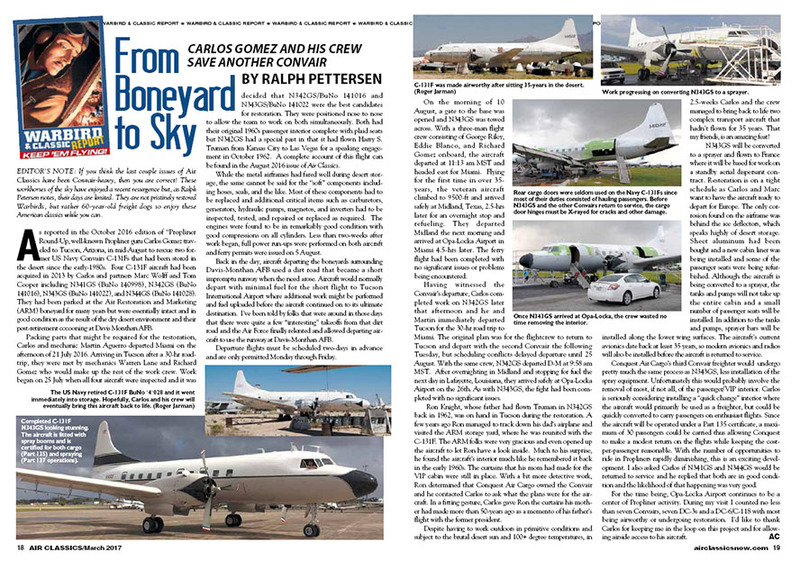 I came across Convair ZS-BRV in 2004, when still operated by Rovos Air; see my 2004 South Africa report. C-47B N836M 'Luck of the Irish', R28Dec12 to Air Heritage Museum, Beaver Falls,PA. Indiegogo.com project. "Last time I saw it, about a week ago (early March 2017 -Webmaster), everything was in place and they were doing gear tests and weighing for CG. As such, it was structurally empty and the wings were for static display only. A lot of work has gone on with the electrical, hydraulic, and fuel systems as well as rebuilt engines and proper wings. The interior is furnished with six lightweight leather chairs for passengers as well as the two pilot seats. The furnishings have been kept simple/light/utilitarian as the owner plans to fly friends and grandchildren to the many large lakes in the region. A nice touch is the Grumman logo has been laser etched into the thin verneer on the cabin to cockpit bulkhead! The other side is similarly done with a map showing area lakes and airports. The aft galley/toilet compartment has been left empty to serve as a changing room. The Goose is one of those types that were once common (or I should say relatively common considering the few built, at least by WWII standards) and many think there are more flying than there actually are. The end of May will mark the 80th anniversary of the aircraft's first flight!" And pleased to publish a photo seeing the restoration finished in a glorious way, from the Pemberton & Sons Aviation Facebook page, which I recommed you to visit for there are quite a few worthy photos of their excellent projects and of this particular Goose the aerials are magnificent! Grumman Goose N95467 in flight: the first flight was on 17Apr17, flown by test pilots Ball and Addison; another wonderful restoration project by Pemberton & Sons completed! I hope I can visit them someday. I later found that Pemberton & Sons also did the restoration of Boeing oldest (built in 1927!) passenger airliner, the Boeing 40: www.flyingmag.com (2011). 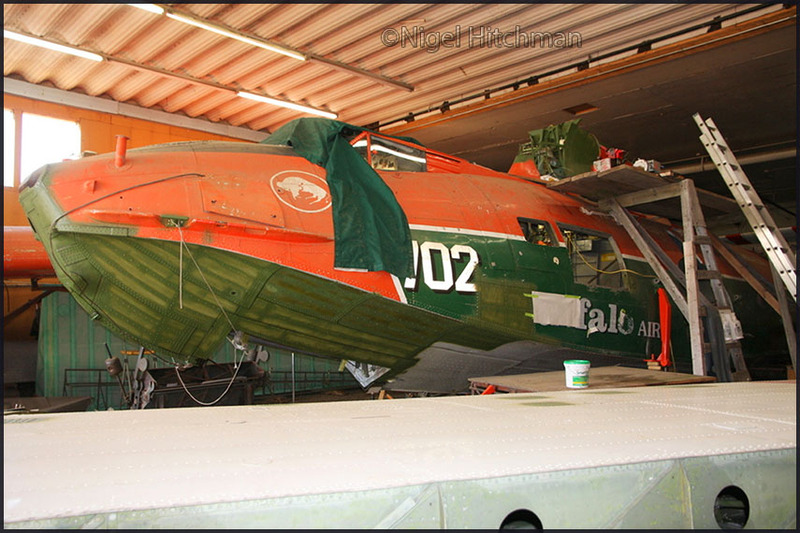 Nigel Hitchman provided this 2012 photo, taken duren a visit, to illustrate the news on the restoration of C-FNJE: first flight after restoration is expected this (2017) summer! Canso PBY-5A C-FNJE (CV-437) has featured for years on my page Abandoned Wrecks of the North; this Buffalo Airways waterbomber suffered an accident and sank but Don Wieben bought it and a few enterprising people pulled it from the Sitidgi Lake, brough it to Fairview, Alberta and got to work! Enormous progres has been made since this photo was taken and that special day is fast approaching! And indeed, I learned that on 18Jun17 C-FNJE made '1st post-restoration flight'. 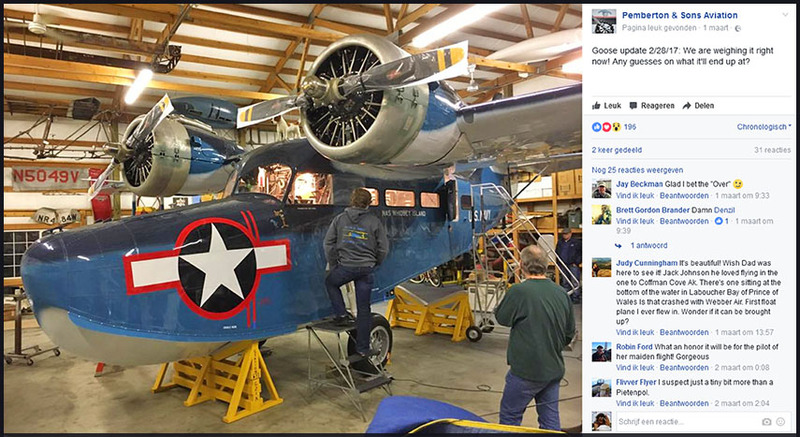 Congratulations, Fairview Aircraft Restoration: job well done! On 18Jun17 C-FNJE made '1st post-restoration flight'! Congratulations, Fairview Aircraft Restoration: job well done! This here is Lockheed L-15/PV-2 Harpoon N7249C (c/n 15-1137). One time owner Quarry Products in mid-1990s and reported as 'stored in not too good condition' in my database. 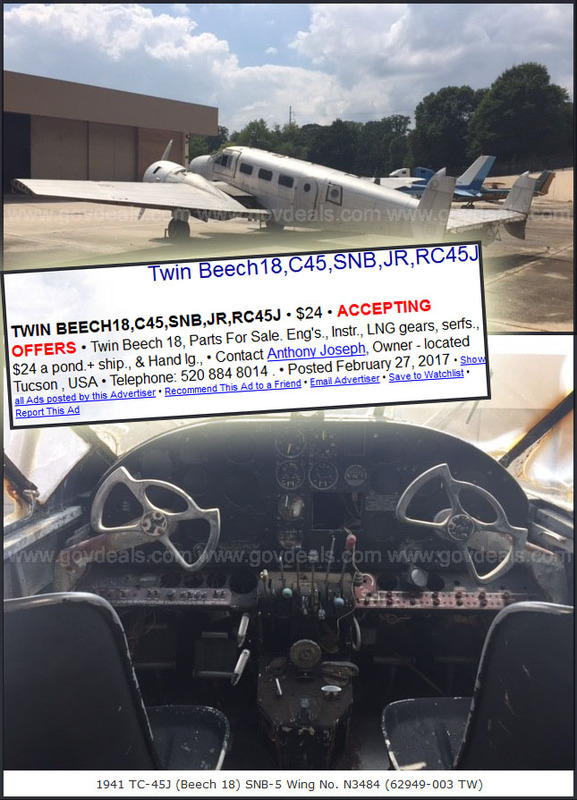 Bill Bailey was able to give me the lowdown: "Hi Ruud, N7249C is in the same place outside John Lanes Airpower Unlimited operation, and with the same owner who has enough interest to keep it, but not enough money to do anything with it... It's been gutted inside and all the control surfaces are off, but all the valuables are in storage. It looks bad from the outside, but it's still a good candidate for restoration!" 37171 US Navy acc 26APr45, del 10Oct45. To Pool HDN FAW6 Nov45, Pool HDN FAW4 Dec45, HDN FAW8 Alameda Jan46, in transit Mar46, Pool Alameda Apr46, repair Quonset Point Jul46, Pool Quonset Pt Jan47, Pool A&T Quonset Pt May47, NAS Whiting Jul47, ATU VP-11 Nov47, Pool Corpus Christi Jul48, Pool Moffett Aug48, overhaul Moffett 09Aug49, NART Columbus May50, O&R M&S Alameda 10Mar52, NAS NART Niagara Falls 09Aug52, FASRON-111 Bermuda 24Aug53, NART Niagara Falls Aug53. To storage Litchfield Park 17Aug54, retired. Stricken 17Dec56 (4901=UFS), tt:1241 hrs. 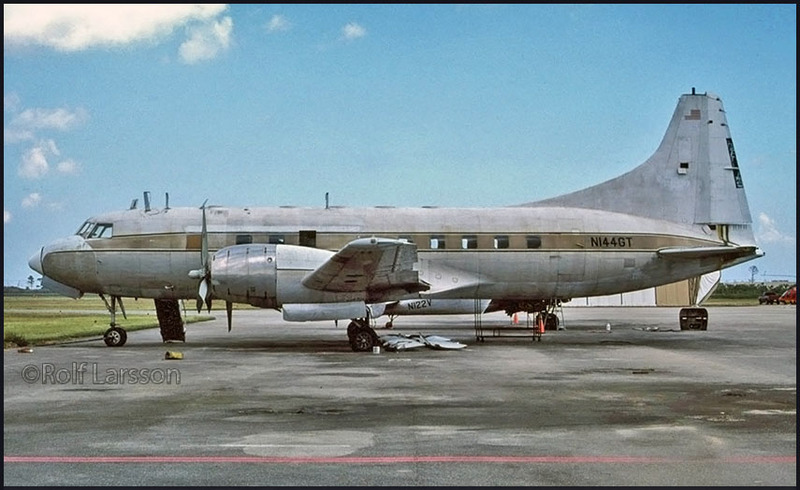 Sold at North Island, San Diego to Master Equipment Company 12Aug57, reg'd N7249C 20Jun69. Converted to civil agricultural use-sprayer by Douglas L. Yotty at Douglas-Bisbee,AZ Nov72. To RALCO 01Feb79, reg'd 22Aug79, to Westco Interservice Corporation 02Feb82. Stored Chandler,AZ from Jun81 until at least Sep84. To Ralph S. Johnson 15Apr85, Quarry Products Inc 21Apr87, Neil M. Rose (CAR Feb93). 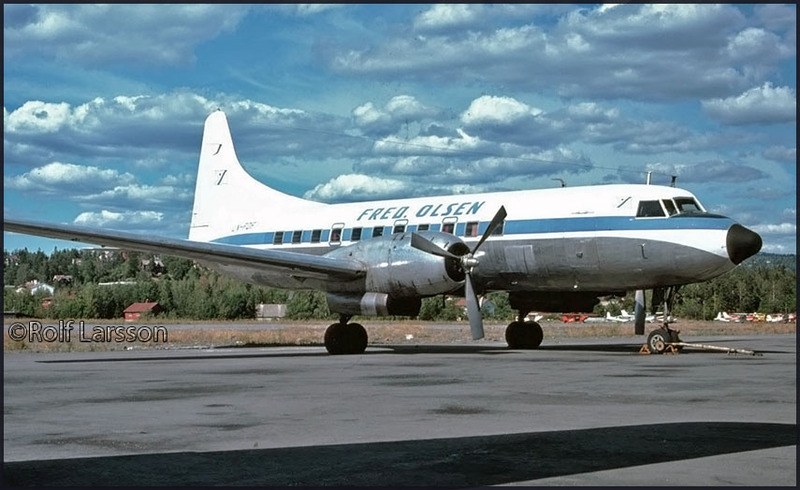 The history of N1822M I have detailed on my page Alaska 1955, when I first came across it. early-1980s and is a very experienced C-46 mechanic! 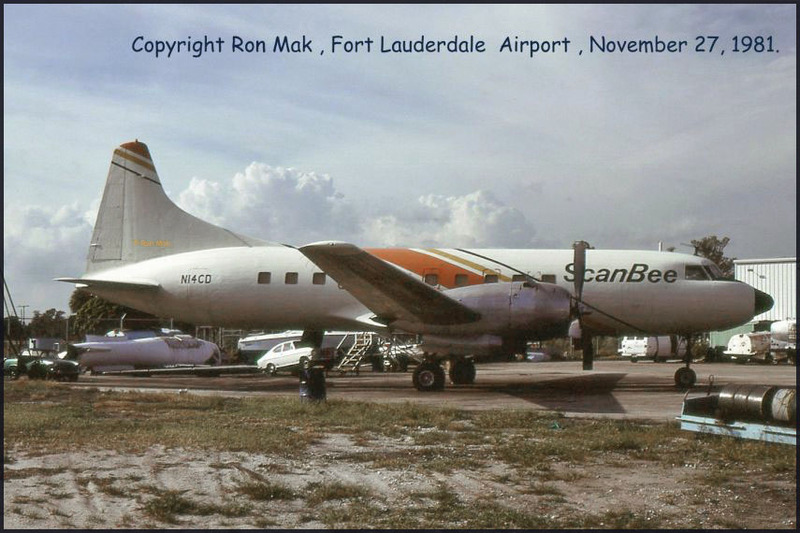 "I noticed the picture of Convair VT-29B c/n 275 N144GT in your 'Propliners in Florida, 1992' section. "Donated to GEORGIA INSTITUTE OF TECHNOLOGY, N144GT, 21 Jan 77. Current at Fulton A/P, Georgia, Feb 83. Sold to STARFLITE CORP, reg'd 14 May 91. Sold to MBM AIRCRAFT LSNG & SALES, & lsd to MIAMI AIR CHARTER, Aug 91. Current at TMB, .. 92/95, with damage to tail. Paul wrote: "Just came across this photo of N144GT taken at New Tamiami on 23Feb1993. Not much sign of damage to the fin although the presence of the gantry would probably indicate that it was being worked on." That date 1993 is relevant because sometime afterwards it was suddenly gone: repaired and flown out? For illegal use, like a thief in the night..? 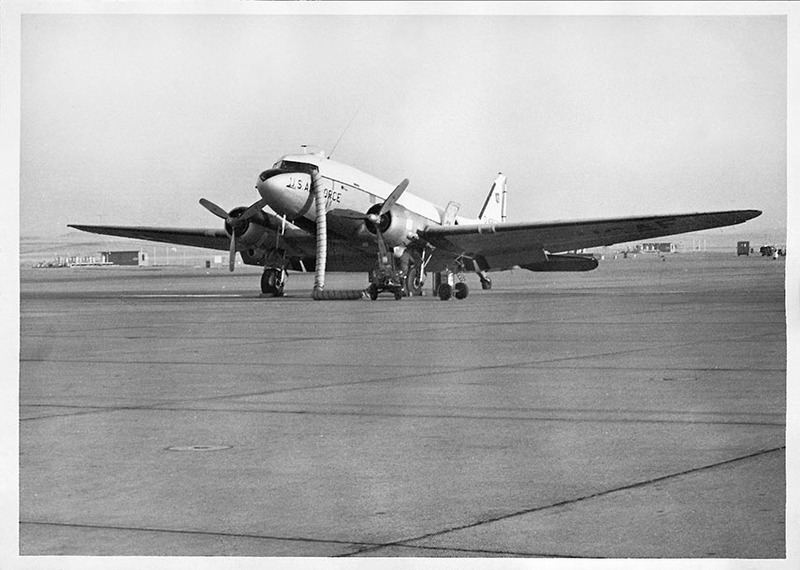 C-54 N1220V of Seaboard & Western. This is one of a batch of 9 I added 05Mar17 to Bill Hill's vintage aviation photos. 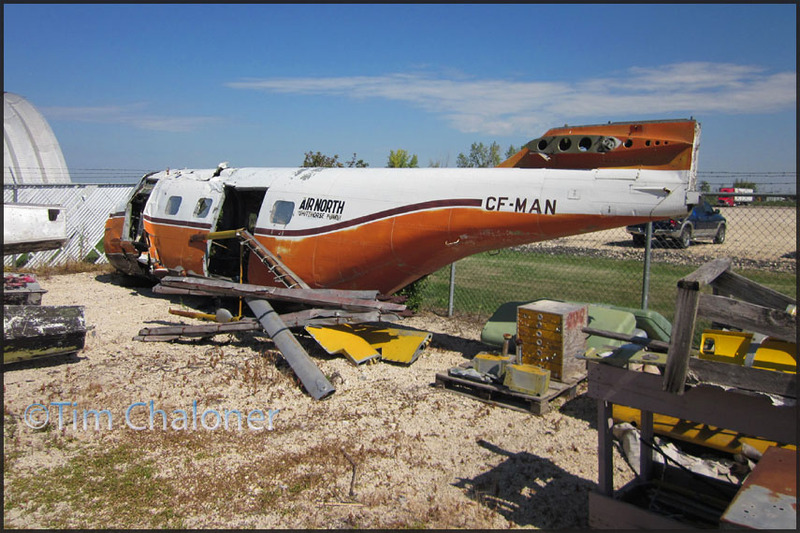 Belatedly I found out that Grumman HU-16B 51-7200 was scrapped as a result of the closing of Chanute Aerospace Museum,IL. Pity, because this modified -A model was the -B model prototype: certainly worth preserving..? 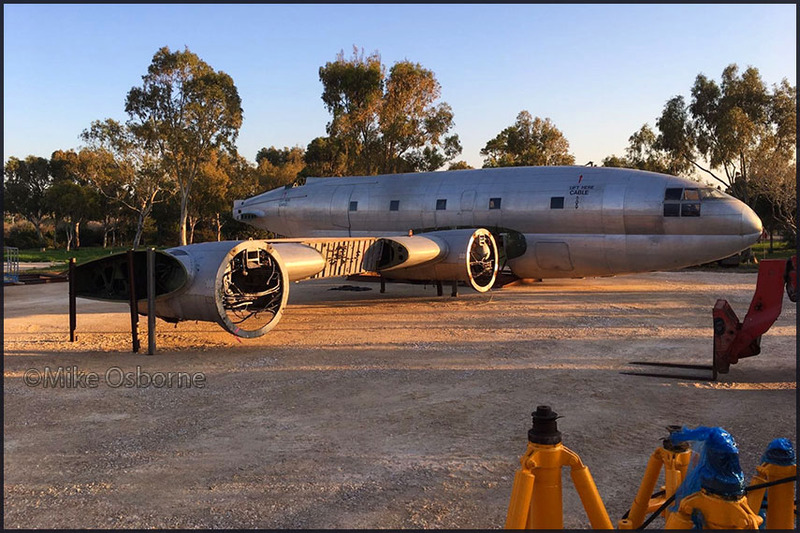 Apparently it had fallen victim to severe corrosion so it was doomed to stay on the ground and when the museum found no takers it was scrapped. It did bring back to mind the closing of this museum and I thought to spend a few words on it here. Octave Chanute (b.18Feb1832, Paris – 23Nov1910, Chicago,IL) was an American civil engineer and aviation pioneer, born in France. He provided many budding enthusiasts, including the Wright brothers, with help and advice, and helped to publicize their flying experiments. ""When we looked at all the numbers and we sat down and reality hit, we said we just can't keep going," said Nancy Kobel, president of the museum's board. The museum is losing longtime support from the Village of Rantoul. Board members say, because of that, unless a miracle happens, the museum will close at the end of December. Chanute Air Force Base used to be the force of Rantoul, but when it closed, it took a lot of the city with it. 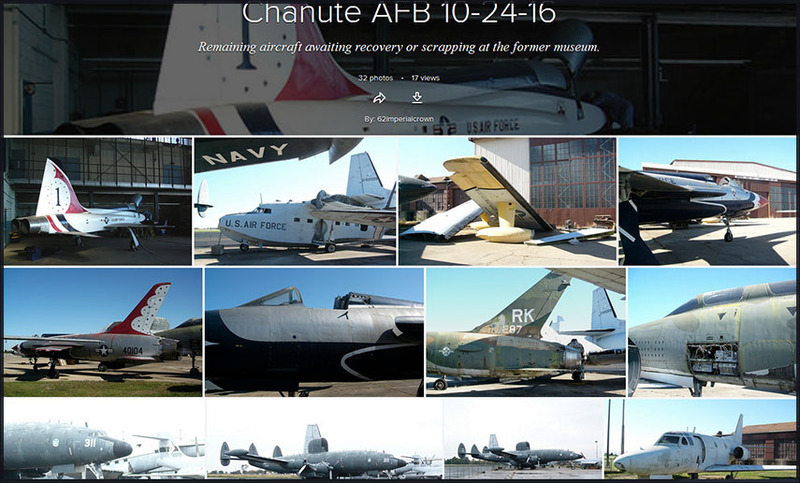 The Chanute Air Force Base opened in 1917 and closed in 1993 due to defense cuts. The museum opened a year later in 1994. Over 1.5 million troops trained at the base in its 75 years of operation. The museum picked up Chanute's history where the military left it. For 20+ years, donations, volunteers and the city helped preserve that history. "2013, we reached a point where we were not in a negative situation financially. We were able to pay our bills. We weren't in debt and hopeful for the future," says Kobel. That is until the Village of Rantoul said earlier this year it could no longer pay the museum's utilities or give it a break on rent because it just didn't have the money. 10,000 - 15,000 people visit the museum each year. It costs around $10,000 per month to operate the non-profit. About half of that is rent the museum paid to the village. It's actually a discounted price. If the museum was to stay open, it would cost an extra $64,000 each month which is the amount of the costs the village has been absorbing all this time. The Air Museum has two planes on loan from the U.S. Navy and 32 artifacts, including 28 planes form the Air Force. Other artifacts include a Minuteman missile which stands next to the entrance and a Hound Dog missile. There are plenty of other things in storage visitors haven't seen. "The closing is caused by a trickle-down effect of BRG Sports ceasing to be a long-time tenant of Hangar 1 at the airport — the lease had generated substantial income for the facility — and the construction of the new Lincoln’s Challenge Academy campus in Rantoul. The academy, which has been paying $18,000-a-year rent and $75,000 a year for utilities, will move out of Grissom Hall, which it shared with the air museum, and into its new campus in 2016." "Chanute’s P-51H Moving to Museum of Aviation at Warner Robins. What will happen to the other aircraft currently on display at the Octave Chanute Aerospace Museum, the future is unclear. Many of the airframes are massive and present huge logistical challenges to move, not to mention the enormous financial commitment in doing so. For behemoths such as the C-133 Cargomaster and KC-97 Stratofreighter, the horizon seems pretty bleak, unfortunately. Rarities like the B-58A Hustler, XB-47 Stratojet and WV-2 Warning Star will probably find new homes, but time will tell. " "I was sorely disappointed that the museum has permanently closed, effective November, 2015. I noted work crews on the flight line behind the museum taking display aircraft apart. The base is slowly being dismantled with classroom buildings being torn down. Many of the officer houses are being rented out as well as space in the old dormitories which are being overgrown with vegetation. The Minuteman missile still stands at the original entrance off Highway 45." 'Highlights of the museum included a collection of over 40 aircraft including military fighters, bombers, rescue, recon, and cargo aircraft. Many of these were used for training purposes at Chanute, and most were on loan from the United States Air Force Museum. Museum curator Mark Hanson said: "An F-104 Starfighter was shipped out to Tyson McGhee International Guard Base near Knoxville,TN." 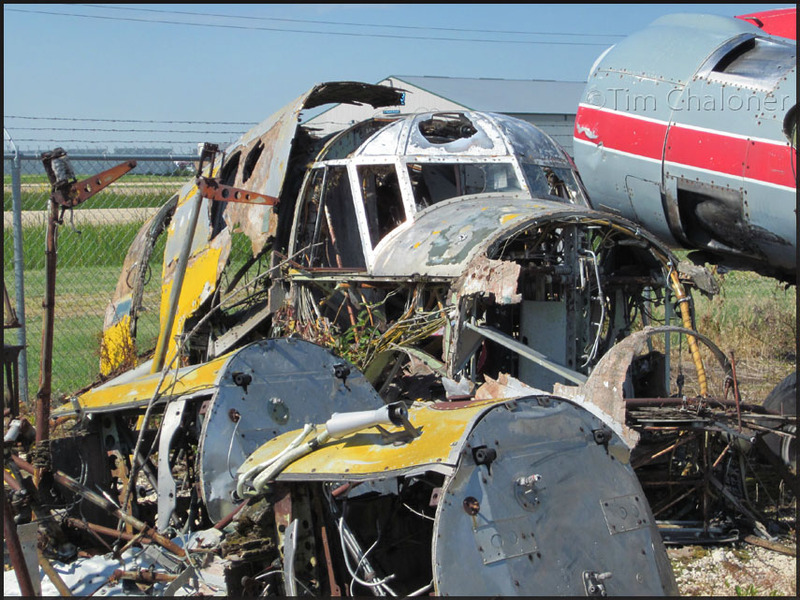 Crews from museums across the country have been trekking to Rantoul to begin disassembling airplanes. The front portion of a B-52 bomber (a crew extraction trainer) was moved to Valiant Air Command Warbird Museum in Titusville,FL. Workers from the Southern Museum of Flight in Birmingham,AL began taking apart a B-25 bomber. Keep me posted on aeroplanes scrapped or moved: EMAIL - thank you! P-51H Mustang, Louisiana Heatwave, ... to the Museum of Aviation at Robins AFB,GA. B-58 55-0666 to (2016) Castle Air Museum, Castle Airport (ex/ Castle AFB), CA. 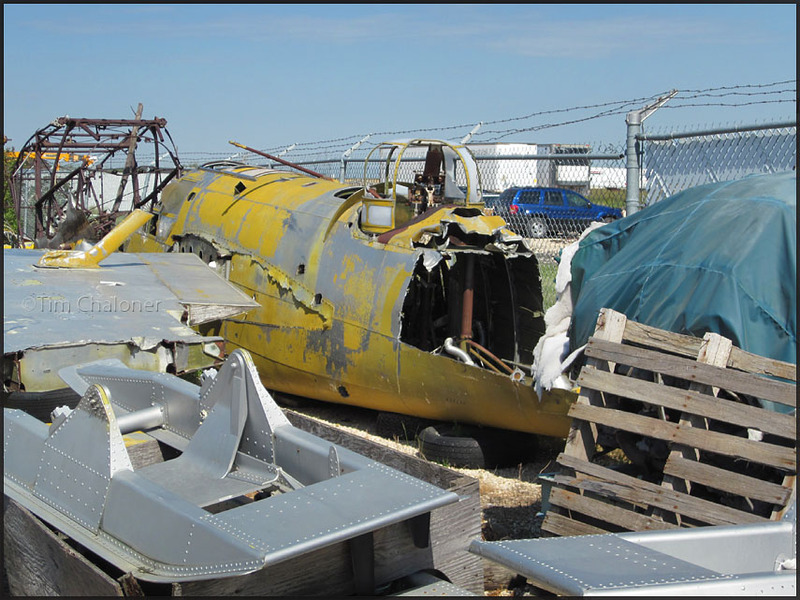 Lockheed ´Warning Star´ at Chanute, to be saved by Yankee Air Museum hopefully! Convair CV580 N??? at Rickenbacker Airport (LCK),OH (05Mar2016). I have a few theories written out, but see Ken's page for those. 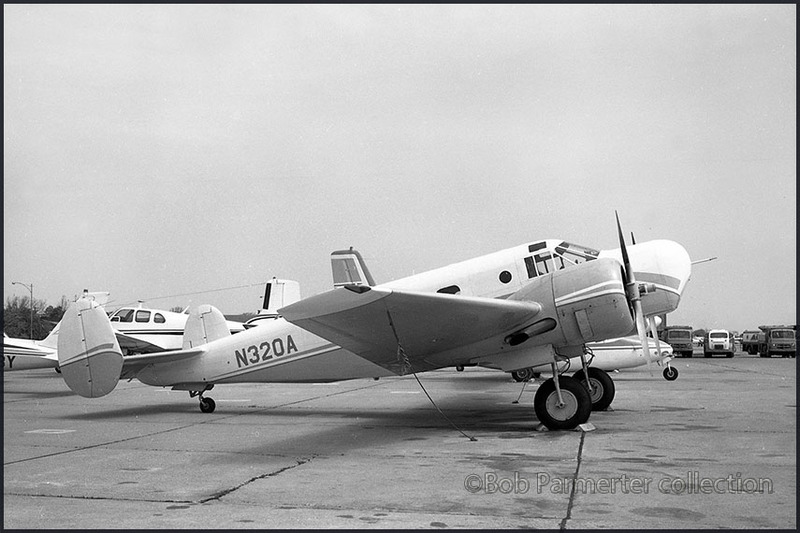 Beech TC-45G, c/n AF-80. C-GAIV briefly appeared in the 2002 movie 'Insomnia', starring Al Pacino. 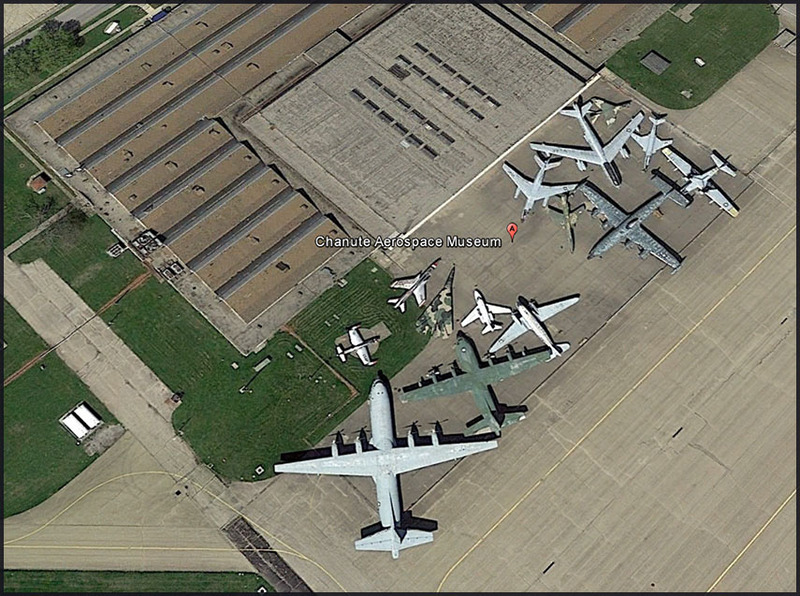 This is ex: 51-2700, CP9/OT-CAI, converted C-119F to C-119G, to G-BLSW, N2700, scrapped 1994 at North Weald." this Bata Int'l (a Hank Wharton outfit! 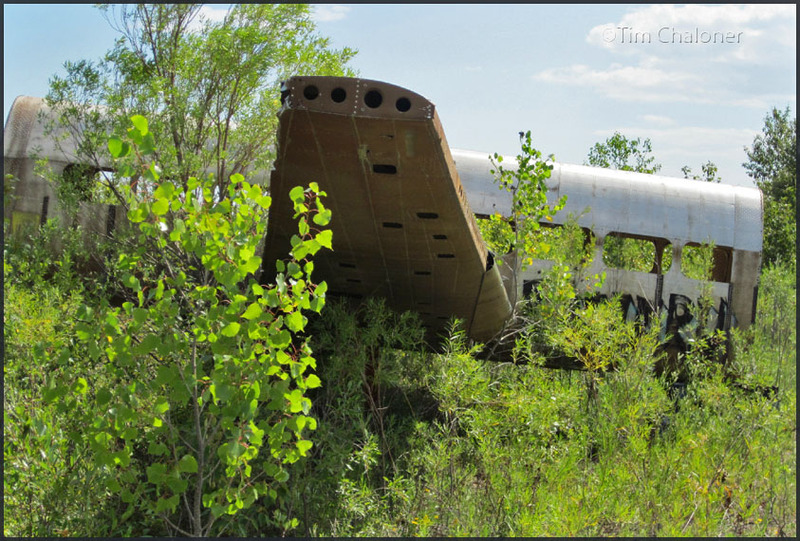 ), ex/N2700, of which the forward fuselage still survives. Hawker HS.748-272-Series 2A C-GGNZ (c/n 1690/172) has as a previous identity ZS-SBU, flying for Sud Afrikaans Lugdienst (SAA), went to Canada, for Austin A/W (becoming C-GGNZ), after which it served with Air Ontario/Air Canada Connector, Air Creebec and lastly for First Air. 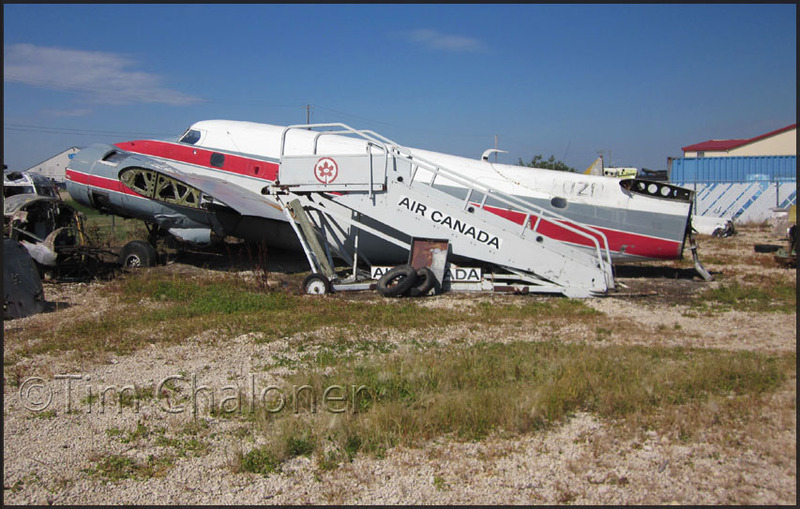 YOU MAY WANT TO VISIT MY OFF-AIRPORT GALLERY, WITH PLANES IN A SIMILAR FATE! Vickers Viking 1A ZS-DKH (c/n 121) to SAA Museum by road. 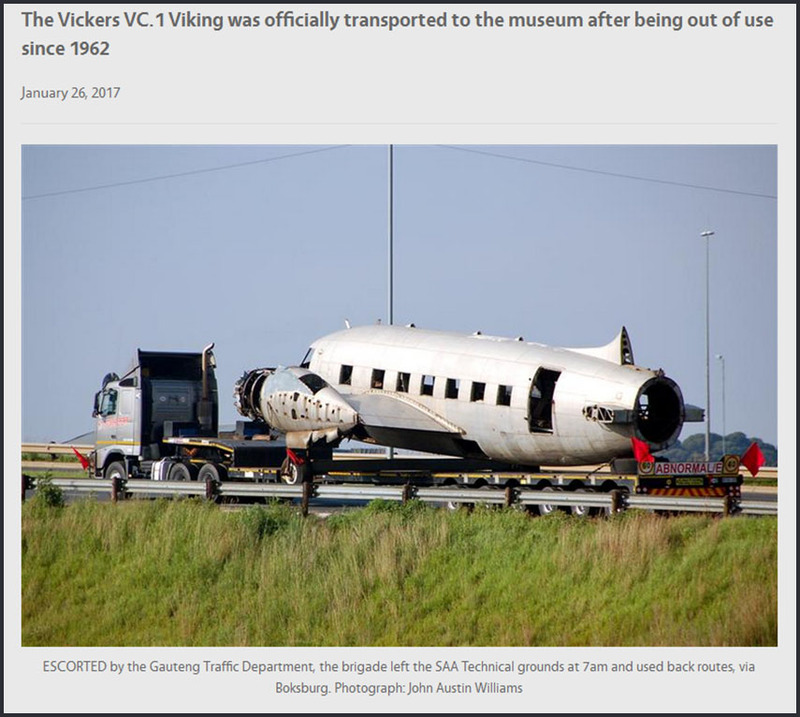 "In January 1963 it was placed on the roof of a Caltex Garage owned by aircraft engineer Victor Edward de Villiers where it stayed for 27 years, before being moved to OR Tambo airport, where it stayed for another 27 years." 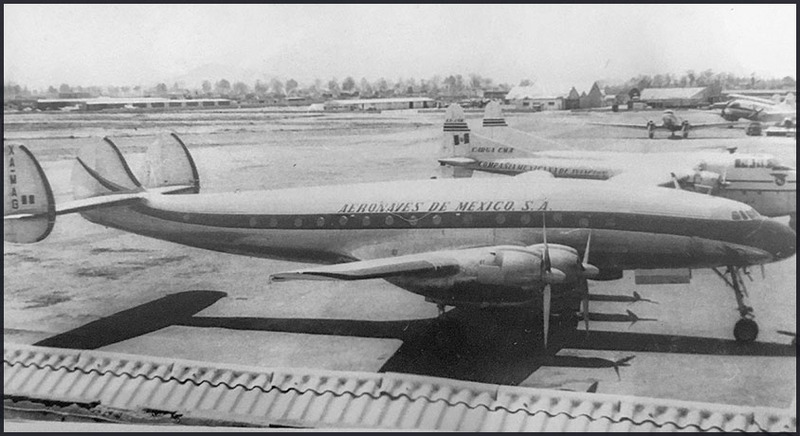 As an update to one of the images on Bill Hill's Vintage Aviation Photos, Alfonso Flores forwarded me this image to illustrate a previous identity of Lockheed L.049 Constellation XA-MAG. The photographer is unknown, the location is Mexico City around 1956. 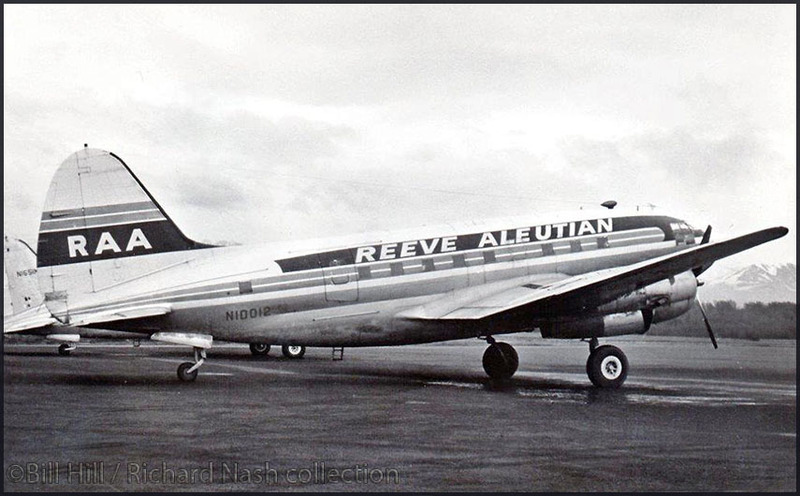 Curtiss C-46D-10-CU Commando N10012 (c/n 33271) of Reeve Aleutian Airways. 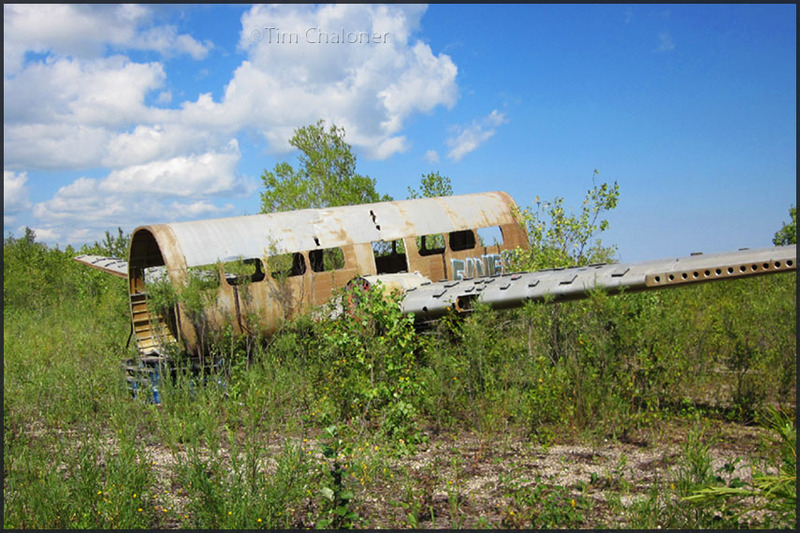 This plane found an icy grave..
Lockheed L.049 Constellation, PP-PDP (c/n 2052). seeing it by a year or two. However, at the south end of the airport we did find this wreckdumped in the bushes! of an ST-27/28. If this info is not correct, please let me know!" EMAIL (read instructions carefully). 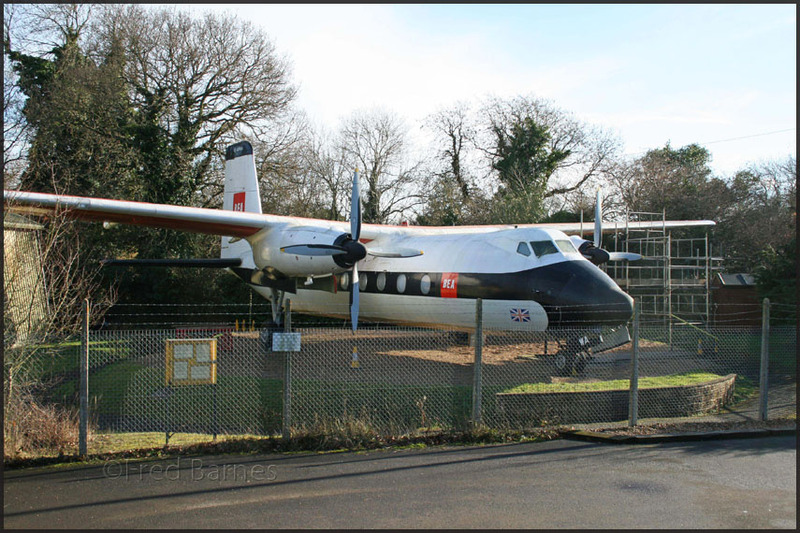 Fred Barnes shared this recent (04Feb2017) image of G-APWA, preserved outside the Berkshire Air Museum. 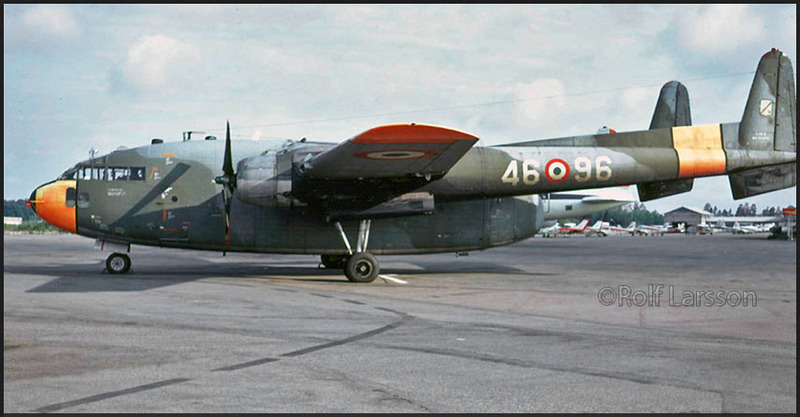 Handley Page HPR.7 Dart Herald (Series 100), G-APWA (c/n 149). Manufactured in 1959.
is near Reading, Berkshire in England of course (website). Fred wrote: "G-APWA was a company demonstrator and was flown worldwide before it was preserved at Woodley in March 1993. Shown in the famous BEA 'Red Square' livery. Looks like the airframe has been cleaned recently." 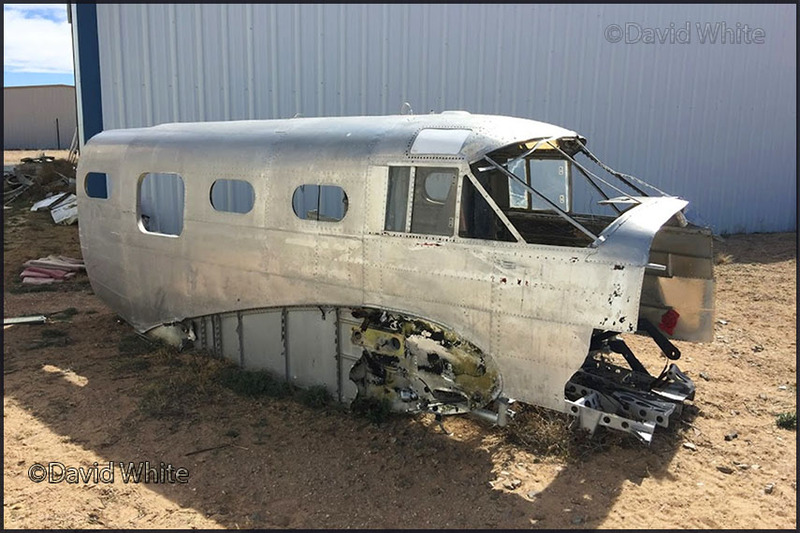 Believed to be Douglas DC-3 EP-AML ? 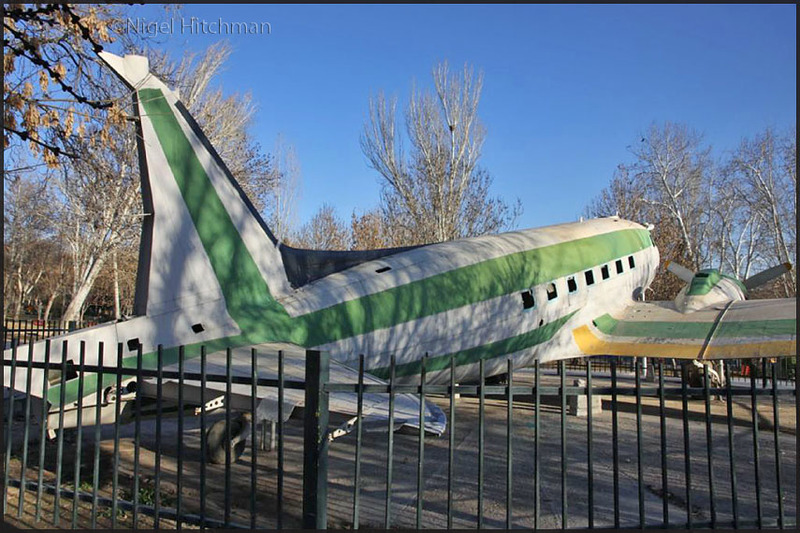 Not the only plane mystery in Tehran..
Tim Chaloner shared with me in Feb.2017 a few images for my website; Tim wrote:"I was recently in contact with Roy Blewett of 'Survivors' and we were discussing the stored aircraft that I saw when I visited St. Andrews, Manitoba/CYAV in August, 2014. 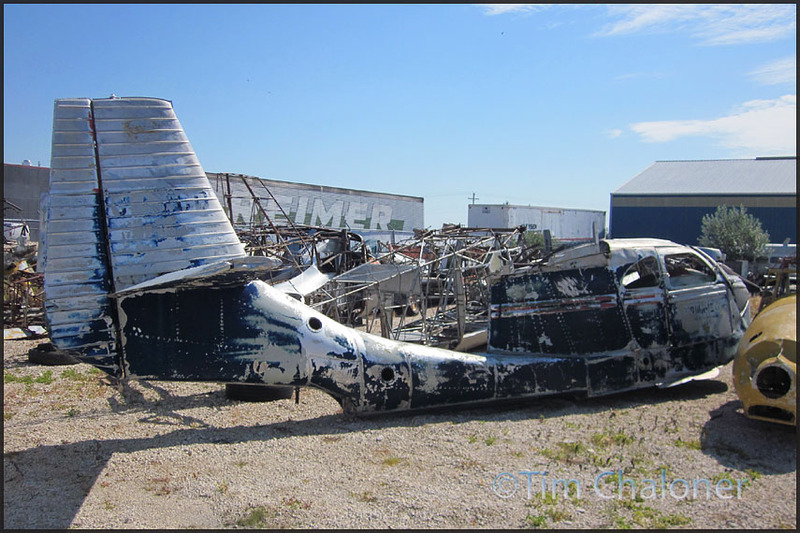 He thought you might be interested to see the photos I took at the Western Canada Aviation Museum storage yard at St. Andrews, in relation to what Norman Smith shared on Photos by Friends & Guests (47). My primary mission was to see a Saunders ST-27 for the first time, and luckily, one was there!" 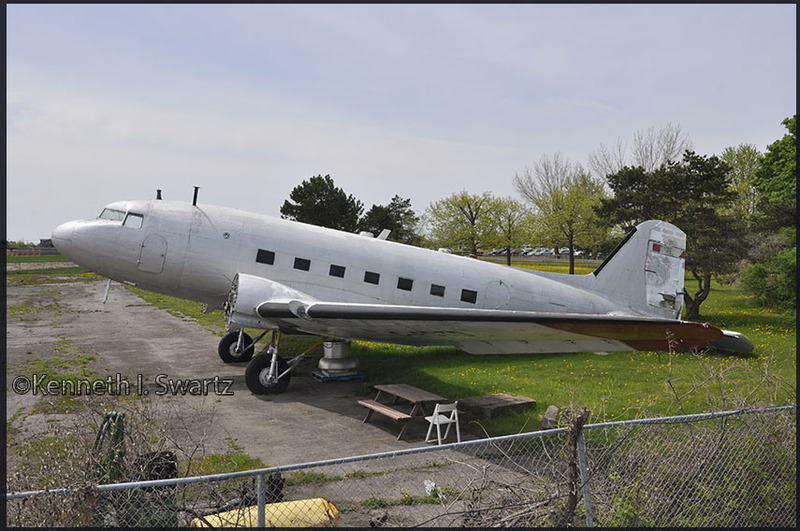 Saunders ST-27 is still with the museum, presently in storage,"..with no plans to restore it in the immediate future." 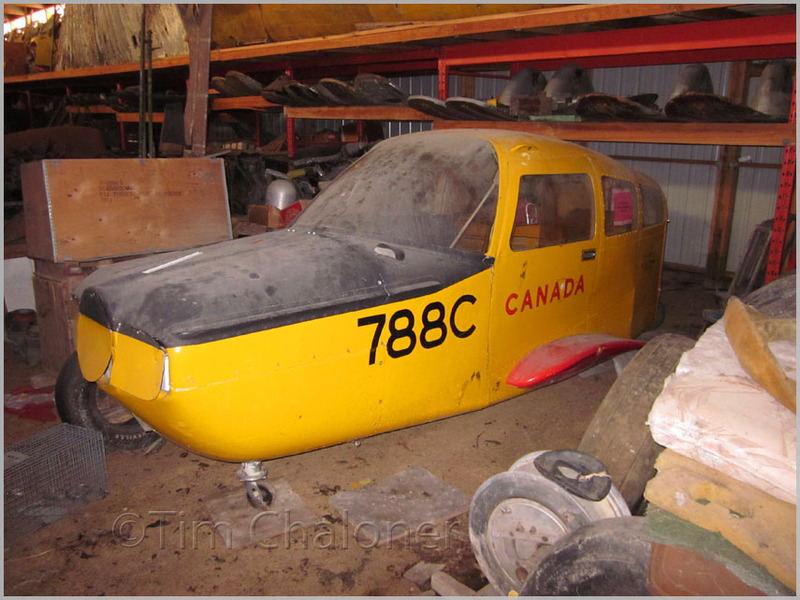 "... to a compound/storage area owned by the Western Canada Aviation Museum with various states of aircraft in it, but one such aircraft being a classic, and as mentioned earlier, only two in the world left and the second ST-27 of the trip to go in the box... unfortunately though CF-LOL is not complete (only the Fuselage) but is still in the aircrafts last operator of City Express.. (50° 3'17.81"N//97° 3'0.93"W)". must be of an Anson (compare it to the one further a few down in this series). Those yellow painted remains may belong to another Bristol Bolingbroke...? On the subject of the Bristol 149 Bolingbroke IV, you may want to check out my visit to a rather unique location near Brandon,Man in 2007: HERE..
"Aero Survey Lodestar CF-OZO operated with Geoterrex and in 1985'OZO was damaged while landing at Nanisivik. Husky CF-MAN here in storage at CF-MAN; indeed worthy for restoration! in the marketplace. 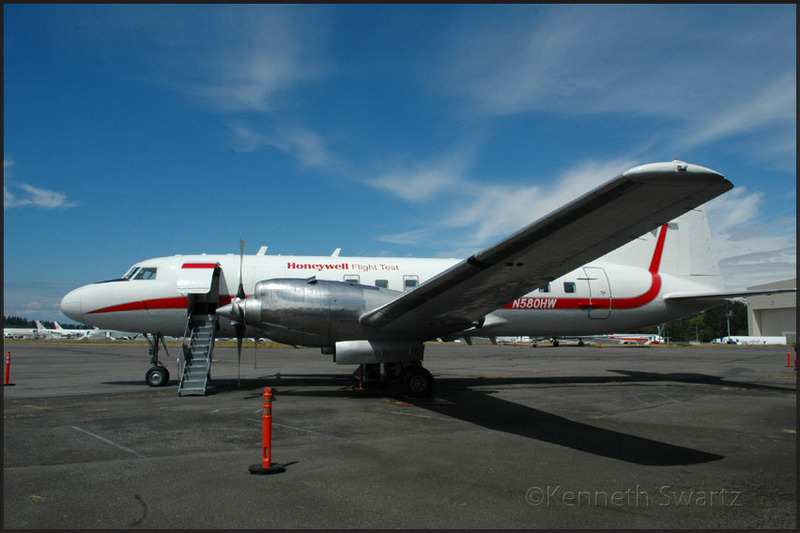 See my 2007 visit to WCAM for image of Husky C-GCYV. that aircraft is the Avro Anson." "My brother Howard and I asked if we could take a look in the storage building, and luckily the employee had the key!" known as the Western Canada Aviation Museum (WCAM). This must be CF-BTC, though Tim had it marked CF-BQT. and a DH.82C Tiger Moth	(crashed)	to this tailnumber. And a Grumman TBM-3E Avenger. 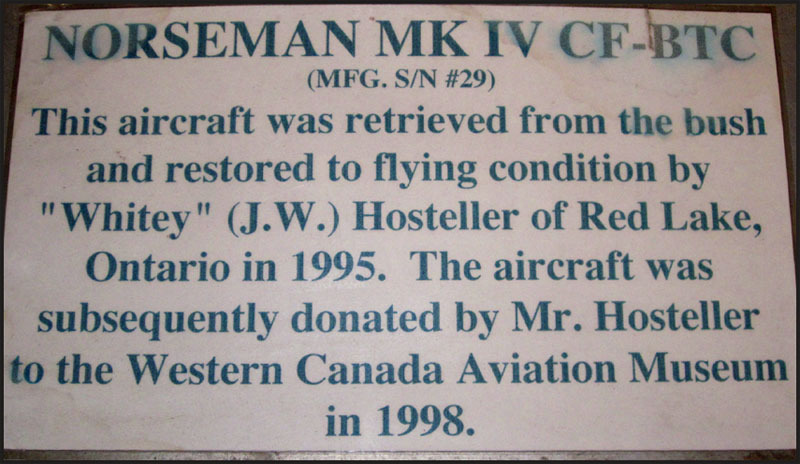 Note: Transport Canada Aviation Civil Registry had no CF-BQT for a Norseman, not even in the history archives! of the Norseman and I agree, the CF-BQT is a mistake, as his photos do not show any reg painted on the Norseman either. Therefore, the plaque which I photographed must be for that aircraft, so that makes it CF-BTC! 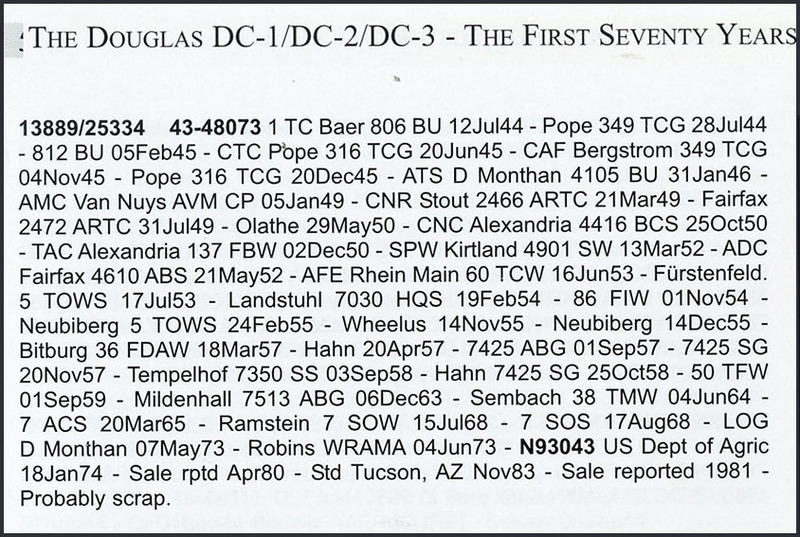 Also, the Bob Ogden book does list CF-BTC under the WCAM section. Not sure where I got CF-BQT from, must be a typo by myself!" worn paint, belongs to a Fleet Fort." The Fleet Model 60K Fort was the only aircraft designed and built by Canadians during the Second World War and was also the first all-metal monoplane built by Fleet Aircraft of Canada (Fort Erie). It was intended to be an intermediate trainer employed for pilot training between the deHavilland Tiger Moth primary trainer and the North American Harvard advanced trainer. 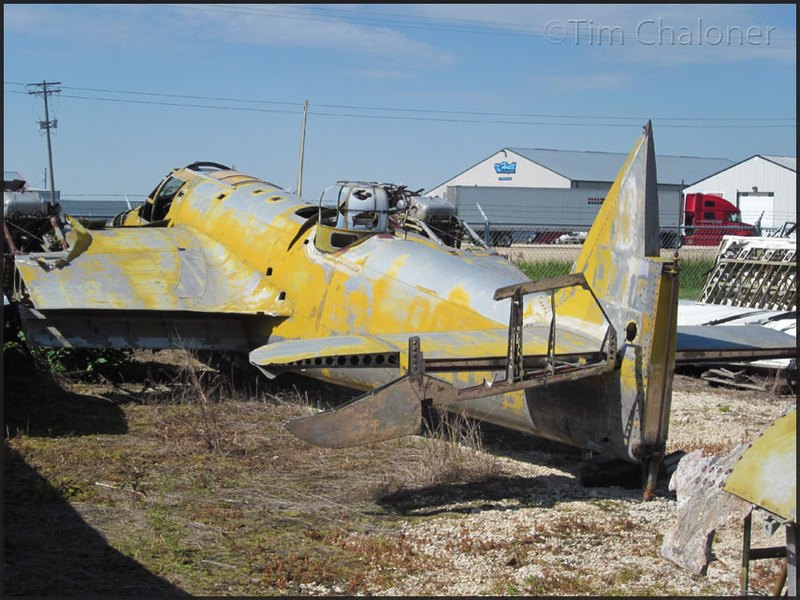 "This forward fuslage of 788C is the Beech Musketeer that the RCAF once used in the 1960s, & 70s." Ken Swartz recently shared these images with me as he had been on a glorious propliner roadtrip on the US westcoast last year. 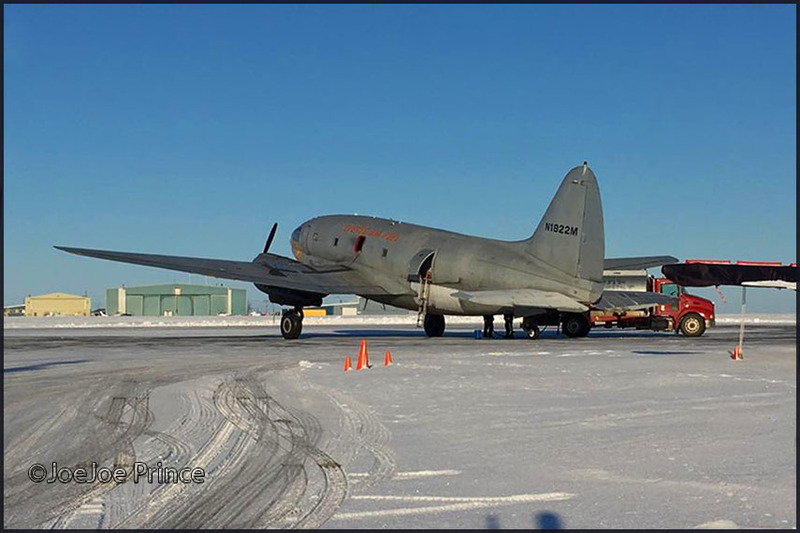 "Aerometal now has five DC-3s on its 'books', either as owners, custodians, restorers or maintainers: N115SA, N341A, N3006, N18121 and N64784. And that doesn't include the fuselage of N15748, which is to be made into the company's conference room!" Note- N15473 not included! The DC-3s on the above photo are though to be: N18121, on the left (behind yellow Stearman), on the right with blue strip and US flag: N341A and in the back, without wings, an unidentified one. Douglas C-47A N115SA at Aurora Airport on 09Aug2016. Still ways to go for restoration. In 2012 I photographed it at the Classic Aircraft Aviation Museum at Hillsboro,OR. owned by the Down Ampney Project. 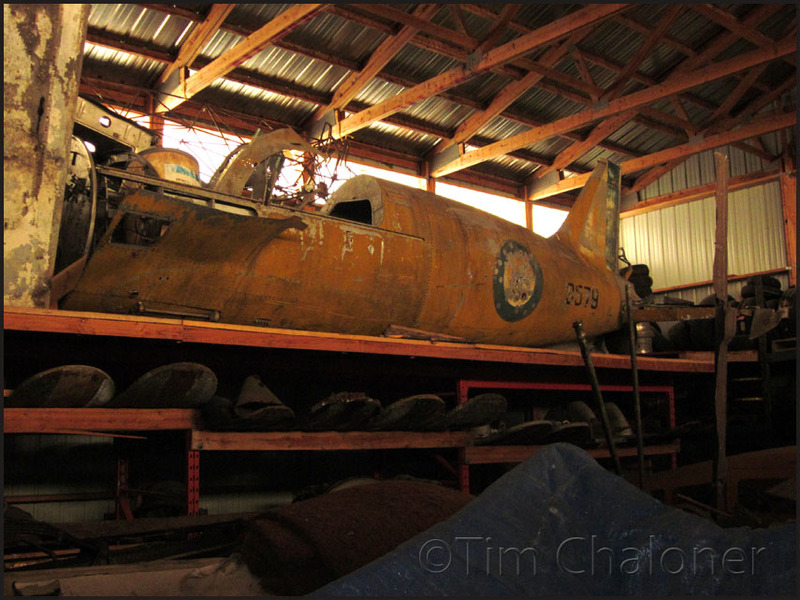 It will be restored into RAF D-Day markings and eventually go to the UK. I hope it's not a sign of anything, but the Project's Vimeo website (linked from the Aerometal page) has expired." N115SA was registered 03Dec03 for First Flight Out Inc., Charlotte,NC. By Nov04 First Flight Out had ceased to operate and N115SA was offered for sale on eBay during Nov.2004; with a recorded ttl 27.863hrs. 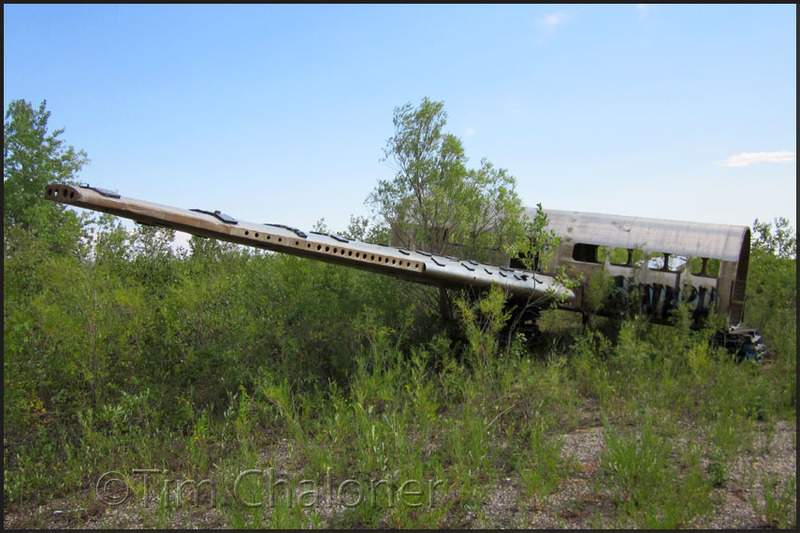 Soon after it was located on private airstrip near Hondo,TX. Reg'd 23Feb07 to James T.Hunt of La Habra Heights,CA. Reported on 26Oct07 at Chino,CA. Then 25Jun09 it was reported as N1159, but this could be a mispole. 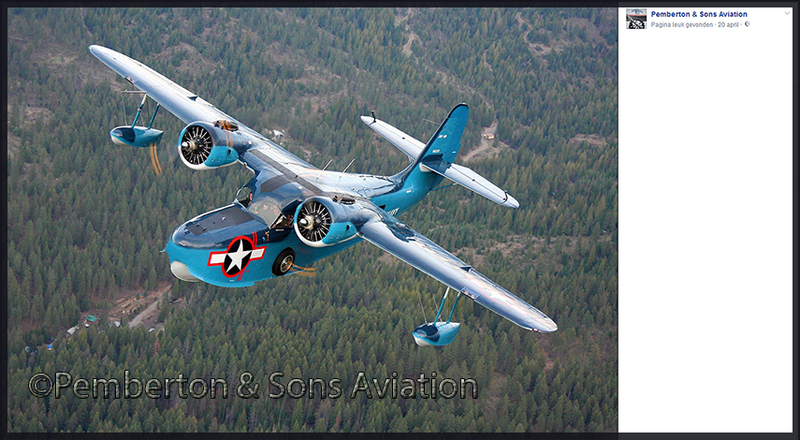 Since 12Nov09 registered to Classic Aircraft Aviation Museum of Portland, OR. 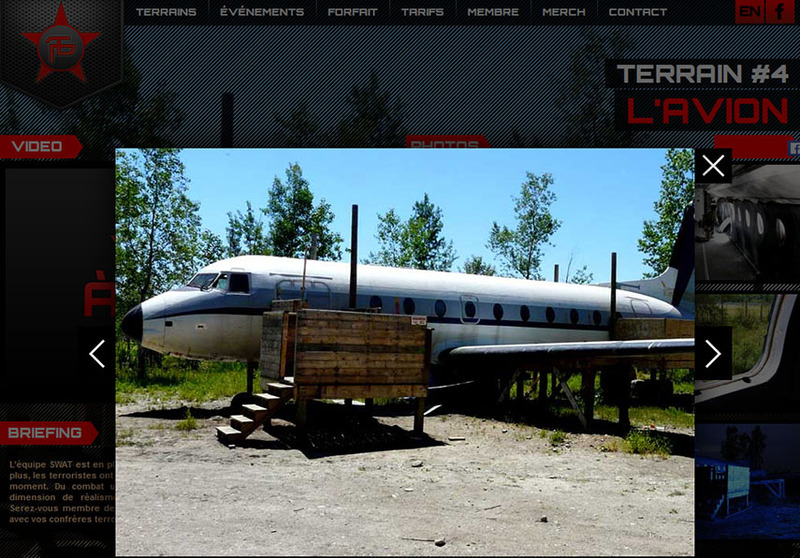 When I checked the FAA N-inquiry website for N115SA I found it still reg'd to this museum. Details welcomed! I came across this N115SA in 2012 (see MY 2012 REPORT, which also has a link to a .pdf doc intercepted when it was offered for sale, providing interesting details. 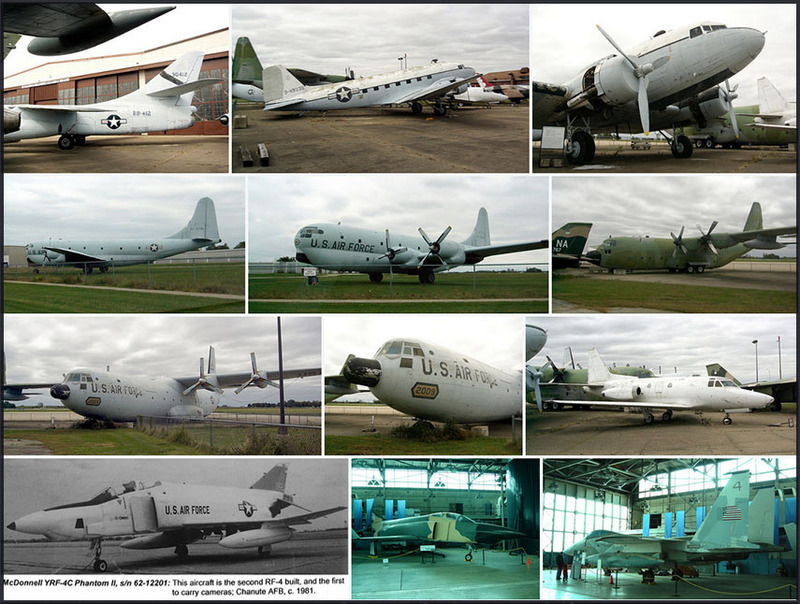 My 2012 page also has details of its career since it started as C-47A and joined the war effort in 1944. 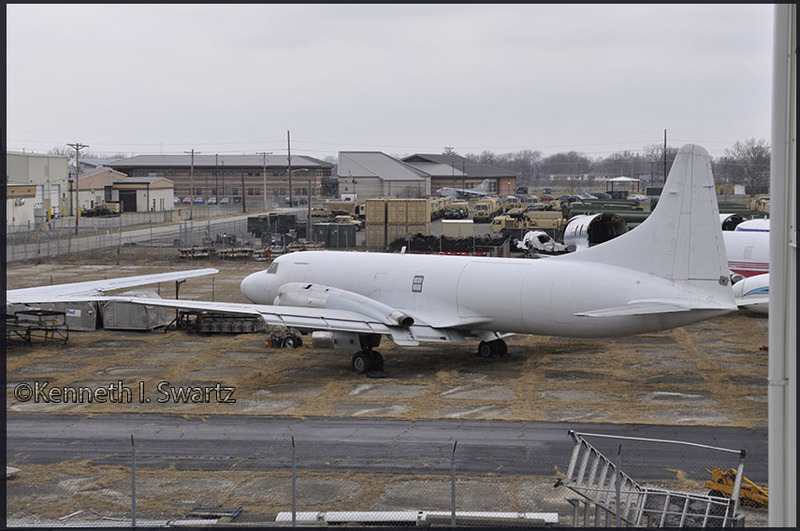 In Scramble #479 (April 2019) I read that N115SA was reg'd to Aerometal in May 2018 but spotted on 03Mar19 at Basler's Oshkosh facility (wings fitted but various parts missing). 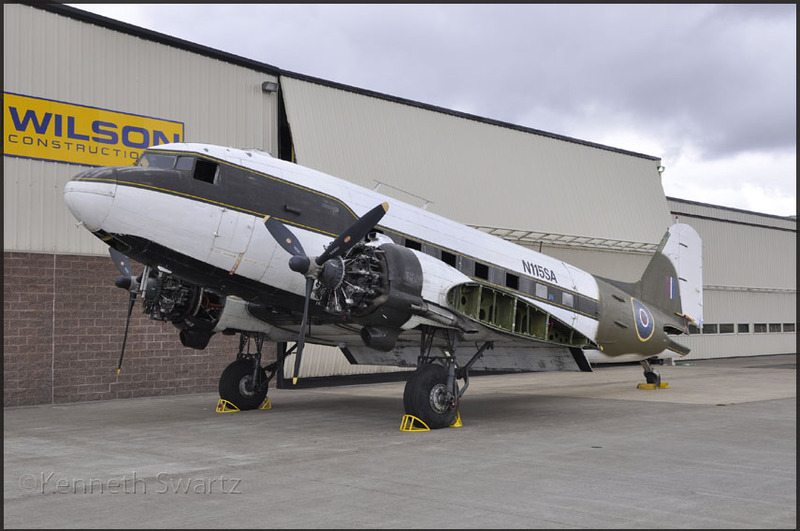 This is Douglas C-49K N15748 (c/n 6337); it will never fly again. 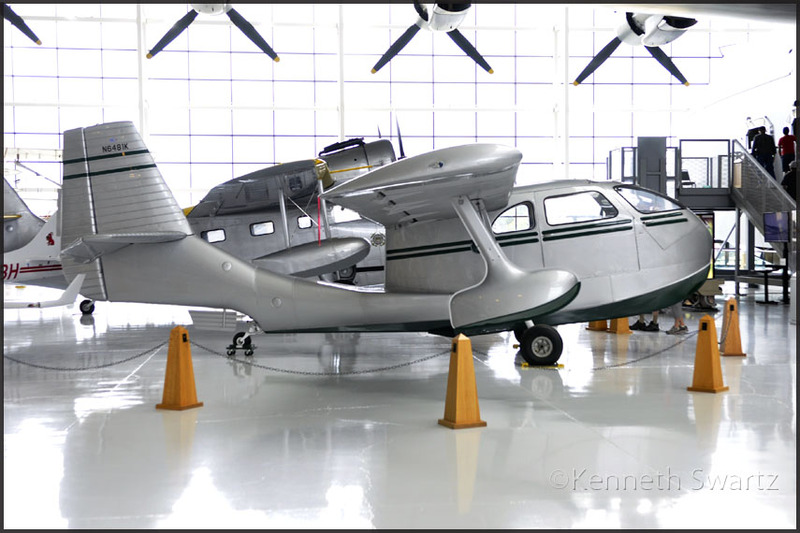 This Republic RC-3 SeaBee N6481K (c/n 736) is preserved at the Evergreen Air Museum in McMinnville, Oregon. Date of visit was 09Aug2016. various planes of the collection, were sold but I think there is till a lot to see and enjoy. Honeywell's CV580 is one of the oldest in the world. It is used to test fly modern avionics. Several flight test aircraft are based at PAE, including the CV580 and an Eurocopter AS350 helicopter. aircraft are expected to move to Arizona (or New Mexico?). Beech G18S N103AF (c/n BA-526); it is operated by Point-to-Point Air, a Seattle area charter service. 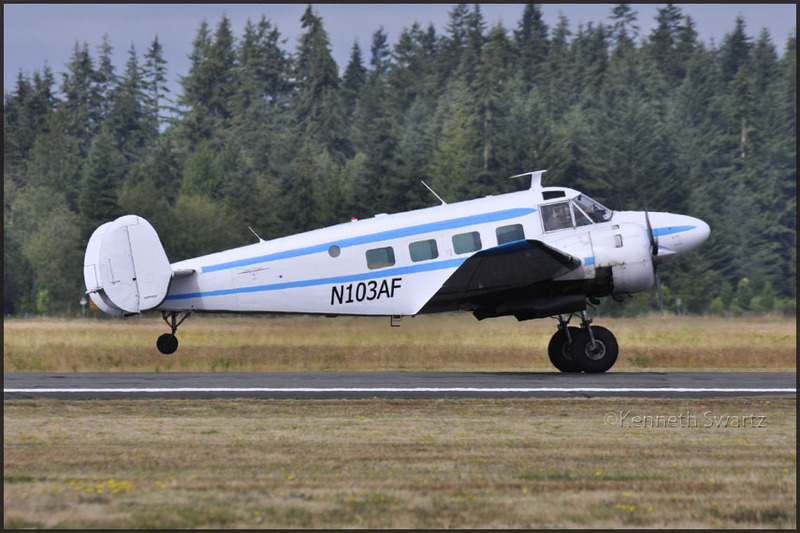 N013AF is seen here at Arlington (KAWO),WA on 08Aug2016. That is where I came across it too, my USA 2014 and where you will find the details of its mishap near Ketchikan,AK: ditched after aborted landing, 03Mar17. 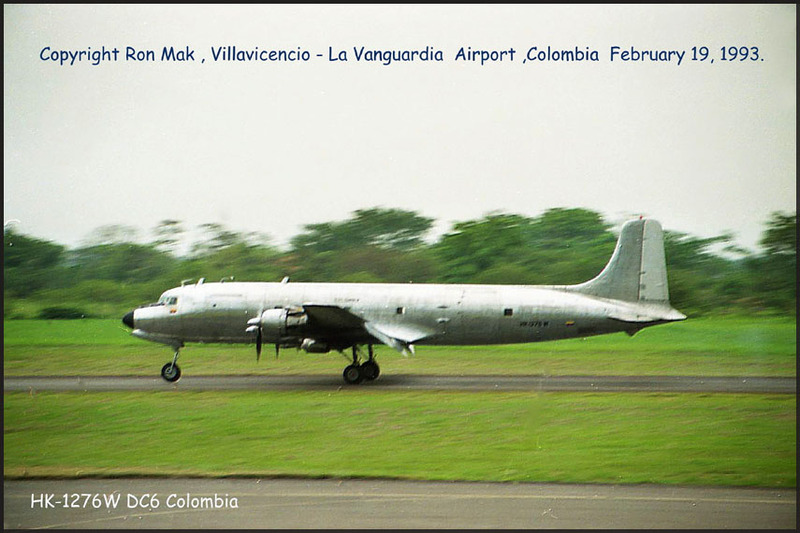 Ron Mak sent me this photo in Feb.2017 during another period of activity researching The Tangled Histories of Colombian DC-6s HK-1776 and HK-1776-W. 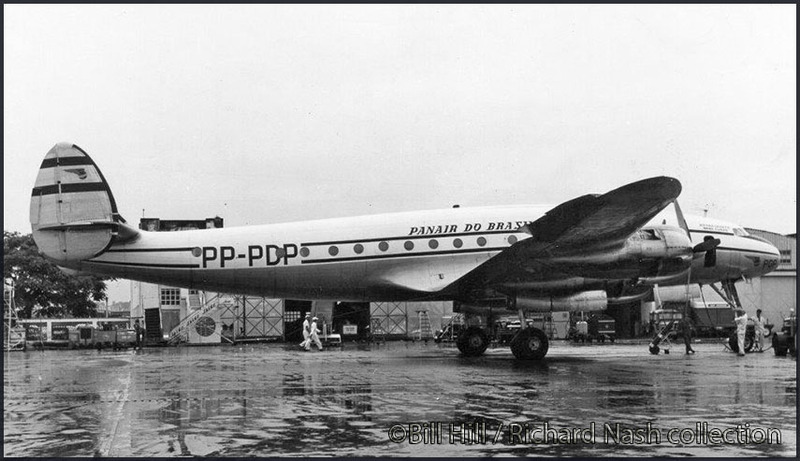 He sent me below photo, but alas found on secound examination, that it was a very similar DC-6, HK-1276-W. NOTE - there is a caption on image tatro08a.jpg which identifies the engine as a '3360-92D radial' engine. The EC-121R was powered by the Wright "turbocompound R-3350-93A-42A" radial engine. Gordon wrote: "Here is me on the prop of my aircraft in Thailand, a EC-121R Lockheed Constellation (USAF 67-21483)."